This year's competition was a lot of work, and a lot of fun. 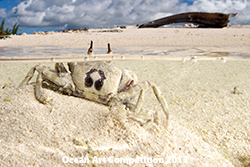 You would think judging a competition would be easy - the judges view the photos, agree on which images are best, and you are done? That is not at all what happened. 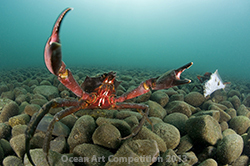 First of all, the major categories each had dozens of images that were worth of winning or placing in the category. 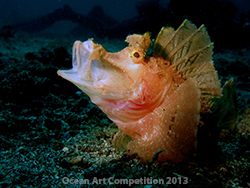 Second of all, the judges had vastly different opinions on which images were best. The conference call was long, and again I learned that a winning image is very much dependent on who is judging the competition. All of us felt that the coldwater category was particularly strong. 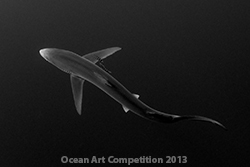 There were many excellent images that did not even get an honorable mention, which could have won other, smaller competition. The same is true in other categories such as wide-angle. 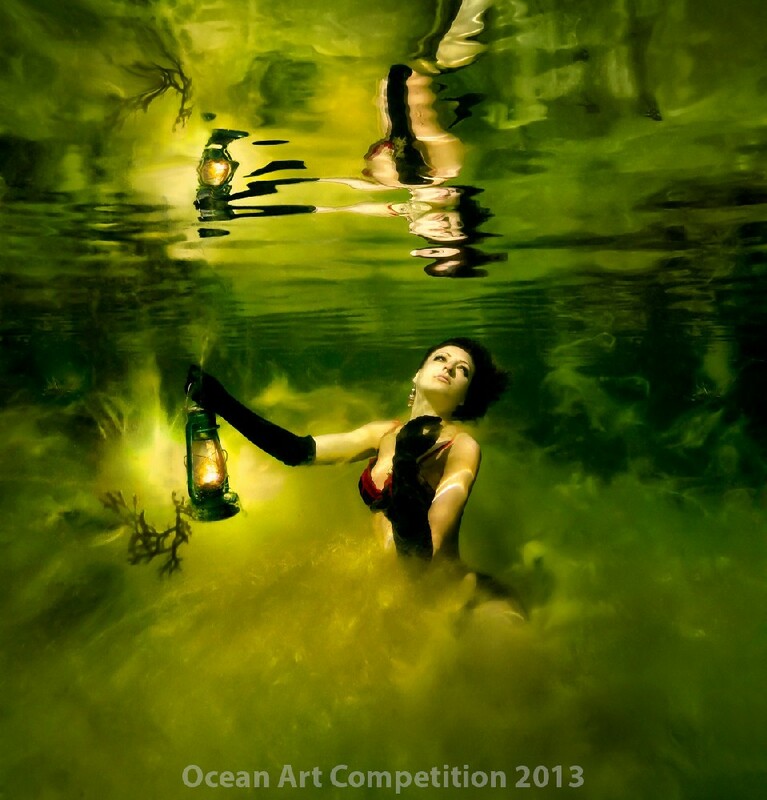 The judges had a very difficult time with the coldwater category, there were so many excellent images. 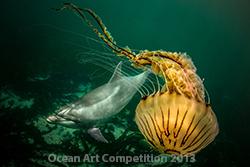 Some of them were not sure if the jellyfish / dolphin photo was real (it is real, I checked the RAW file). Reactions to the "best of show" photo were at first mixed, but the people who liked it really liked it, and those strong feeling in the end let it to win the best of show category. 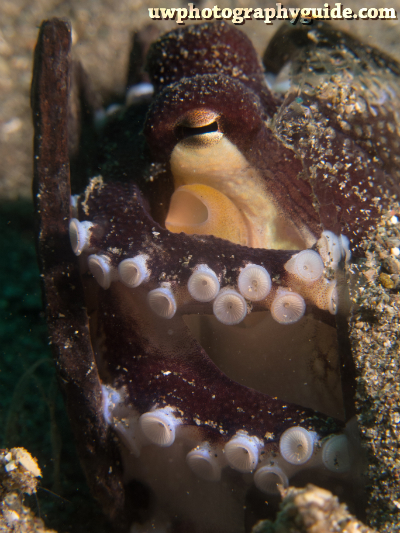 Some of the judges were not sure if the winning octopus photo was thrown into the water column (our judges are generally good at recognizing potential harassment). Having done the Kona black water dive before, I assured them that it was not! 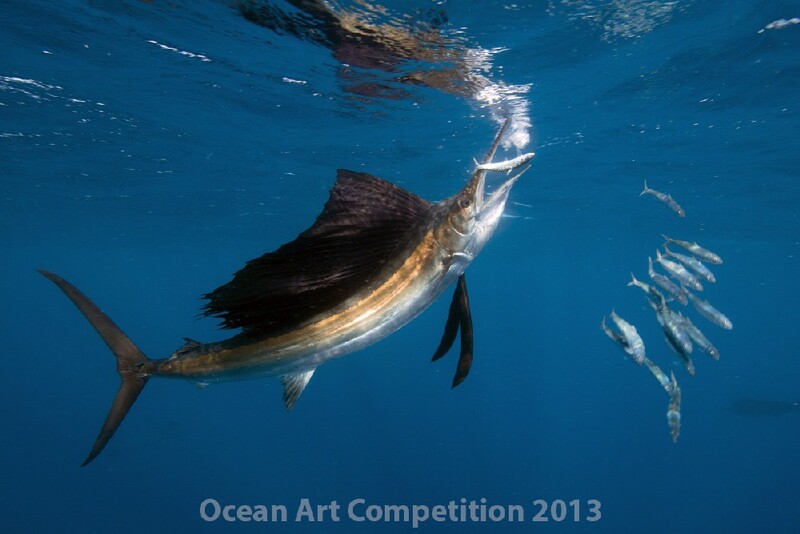 There were several excellent sailfish photos entered into this category, and choosing one was not easy. Marty pushed for this particular photo to win, and everyone agreed. 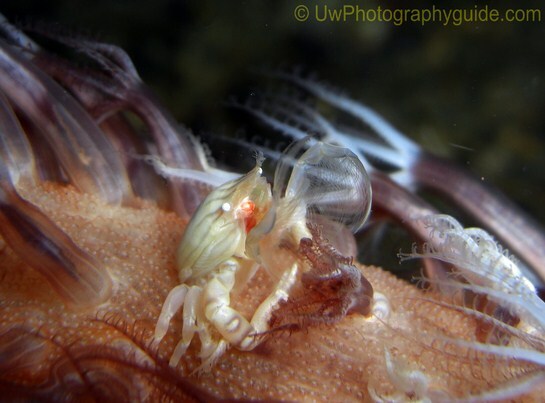 Tony Wu was particularly drawn to both of Tom Radio's images - the brittle star and the crab having his arms (see Tony's detailed comments below). 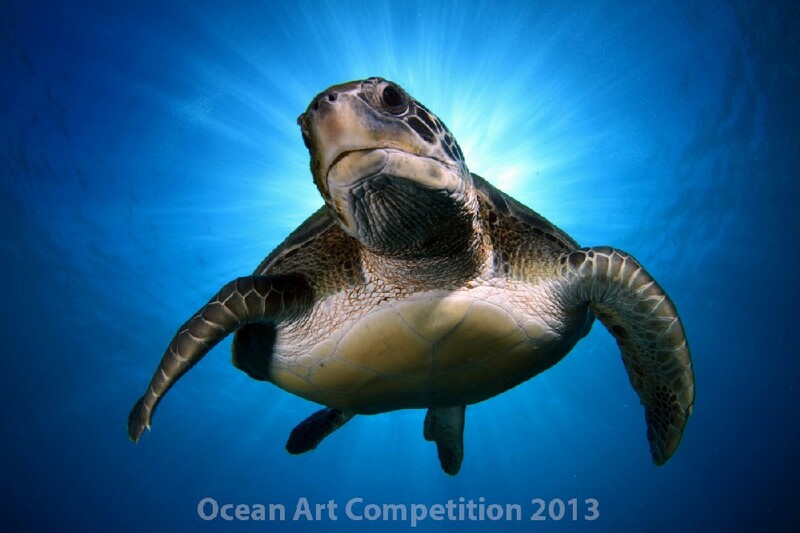 The winning photo of a turtle was one of the few photos in the competition that the judges (mostly) agreed on should win the category. Besides the turtle, this category probably had the least amount of consensus, which is not surprising since a good "portrait" can be very subjective. I wish I could have added 3 or 4 more honorable mentions, there were several photos that were quite good and probably will place in another competition. 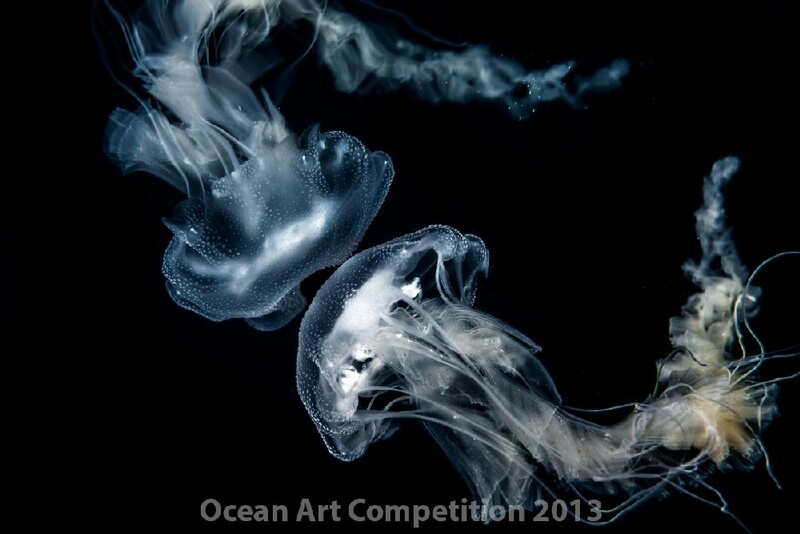 "Every year the images in this contest continue to raise the bar. That bar is now set at a very high level. 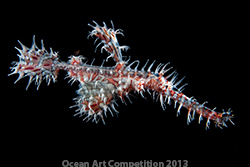 I am sure that says something about the status of this competition and the quality of the contest. 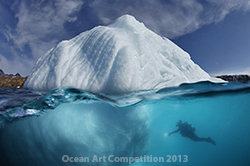 But from a judge’s perspective, deciding on winning images is a serious challenge. Simply put, there was one stunning image after another. 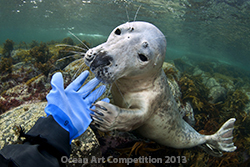 So speaking to all of the entrants, I’ll simply say kudos and thank you for sharing your work." "Congratulations. 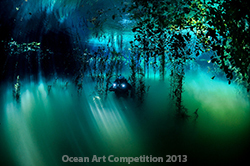 Without doubt, the most demanding underwater photo competition that I have ever been involved in. So many excellent, diverse and wide-ranging images to choose from. 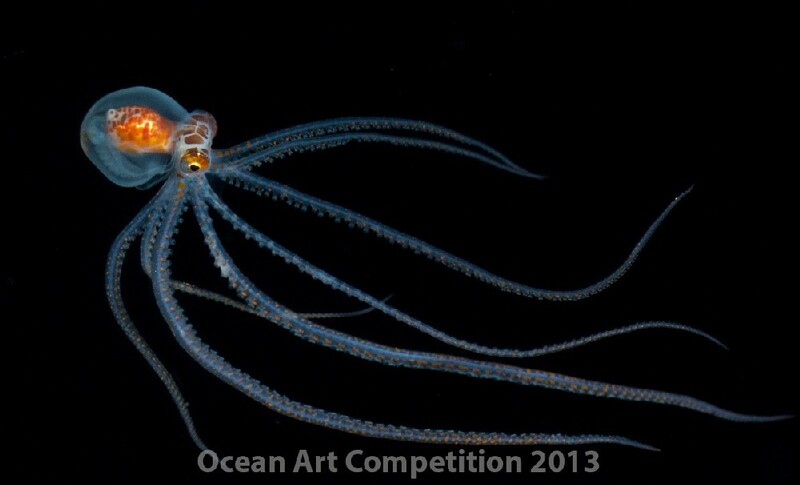 My own personal favourite was in fact the 'Best in Show image' It knocked my socks off as soon has I set eyes upon it! The eclectic tastes of the judging panel necessitated a great deal of compromise and particularly in the latter stages a fair degree of negotiation also. 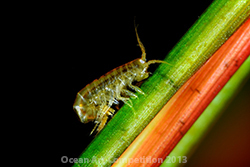 1st place and also 4th place in the Macro Category. 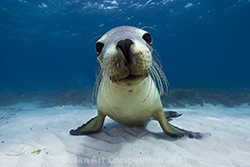 Todd runs several underwater photo workshops every year for Bluewater Photo, and has won over 60 international photo competitions. 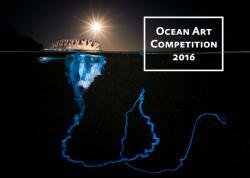 The quality and creativity from this years Ocean Art entries were truly exceptional. It was inspiring to see so many great images at one time. 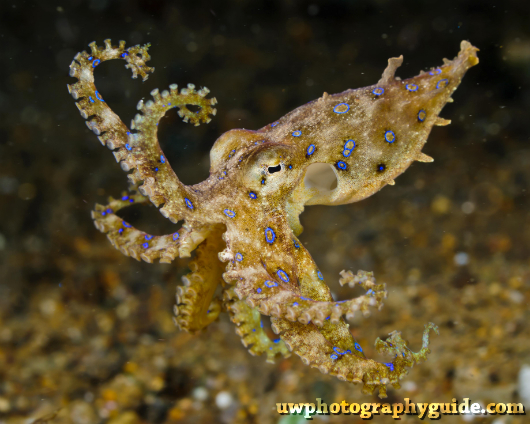 I was particularly impressed with the cold water category, especially when you consider the harsh conditions many of the images were taken in. I also really liked seeing the use of slave strobes, back lighting and other techniques that are a bit less ordinary. 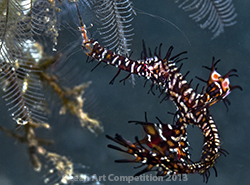 I do have a few tips that I would like to share concerning future contests. 1. Don't enter similar images. It really diminishes from the impact of a great image when you have two or more images that look almost identical to it. Pick the best one and enter it. 2. 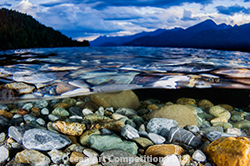 The same is true when you enter images that look very similar to images that have already won in other contests. I think most judges are looking to see new and creative ideas. It's ok to get inspiration from someone else's photo but try not to shoot carbon copy clone. 3. Scan 100% or your image for distractions. 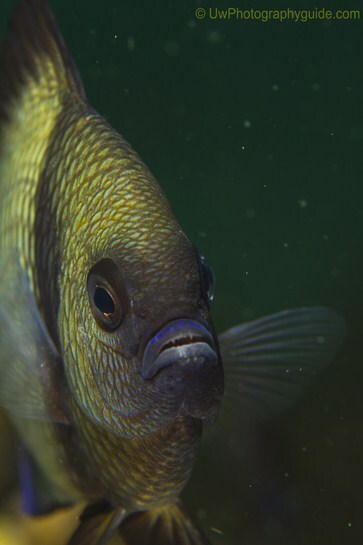 Unfortunately many great images get taken out of the competition early on for minor things that may be correctable by a tighter crop or a spot removal if its allowed in the category. You want your image to stay in the competition as long as possible so don't give anyone a reason to eliminate it early. 4. If you didn't win don't get discouraged. Unfortunately we only have a limited number of places to award. All of the judges have very different opinions on what we each like. We all had images that we really liked but didn't make it to the final cut. 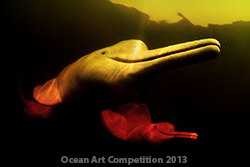 Congratulations to all the photographers of the selected images! 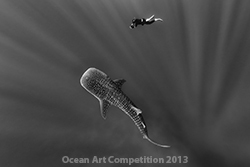 The quality of submissions was superb, and extensive discussion among the judging team means your images truly stood out. One thing to bear in mind: Judging is a very personal process, which means we didn't always agree on choices. But having differing points of view is inherent to any form of art, so even if your image wasn't one of the chosen ones, don't take it personally. 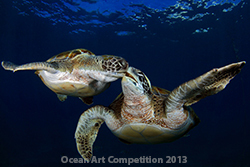 Look at the winners, think about what you might do differently/ better, and enter again! 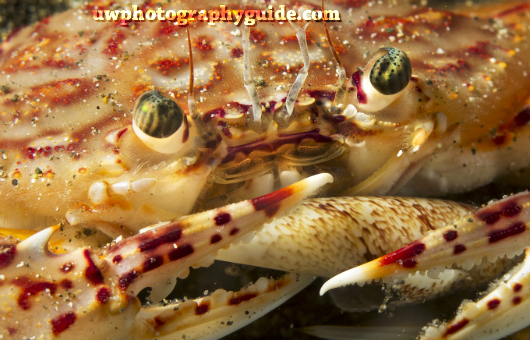 Crabs and rocks are not the most charismatic subjects, so it's not easy to create an eye-catching, aesthetically pleasing image. Composition in this photograph is excellent, with the slight motion blur of the forward claw bringing the image to life. 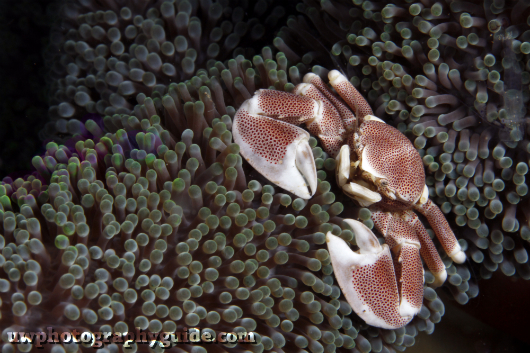 The crab in the distance echoes the front crab, and illustrates the crabs' behavior, i.e., foraging for food. 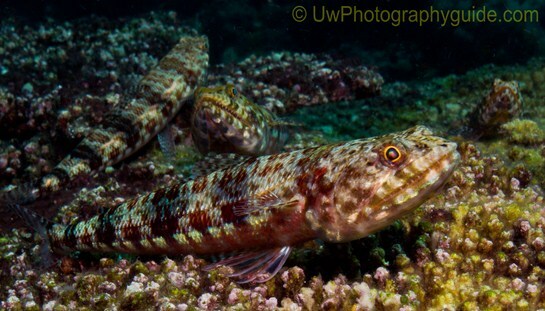 I've seen many shots of these Lubricogobius exiguus gobies. They are popular subjects in Japan. 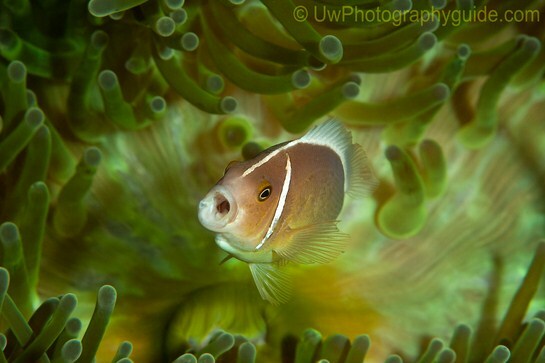 I love the mood lighting, "peeking out" position of the fish, and the overall composition of this photo, particularly considering that it was taken with a compact camera. It's an original interpretation of a oft-photographed subject. 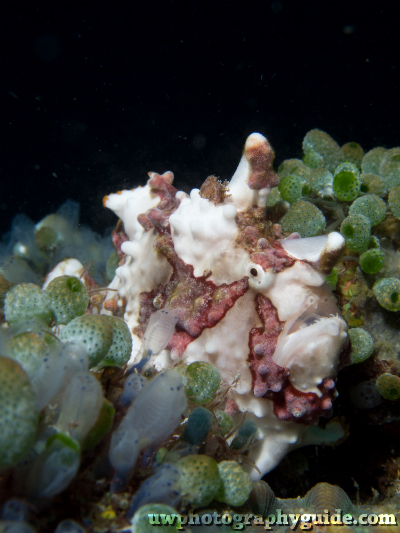 The juxtaposition of a tiny filefish next to a humongous flipflop suggested to me the scale of the human-generated trash vs. nature problem. 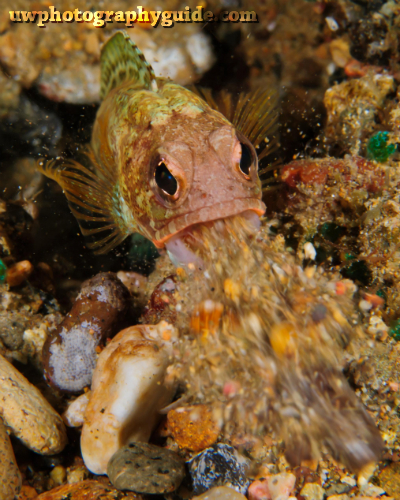 Overconsumption, selfishness, greed and disdain for the world around us have all contributed to exponential growth of waste disposal in the oceans, much of that trash being non-biodegradeable. 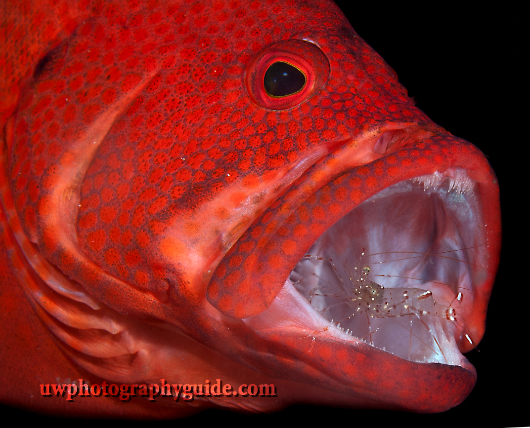 Photographically, I love that the light just catches the fish, not entirely illuminating it. 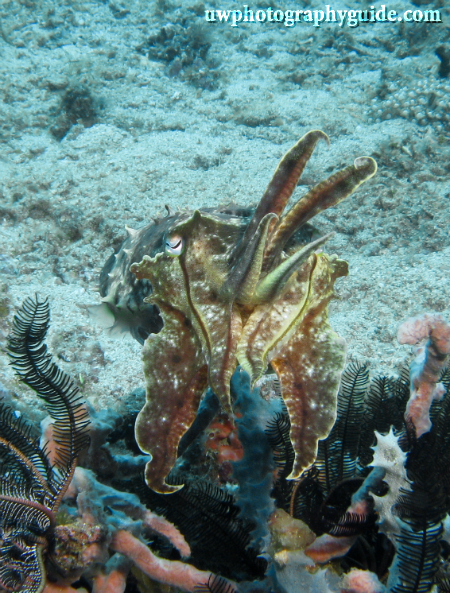 For me, that underscored the somewhat ambiguous nature of the relationships between flipflop and filefish. 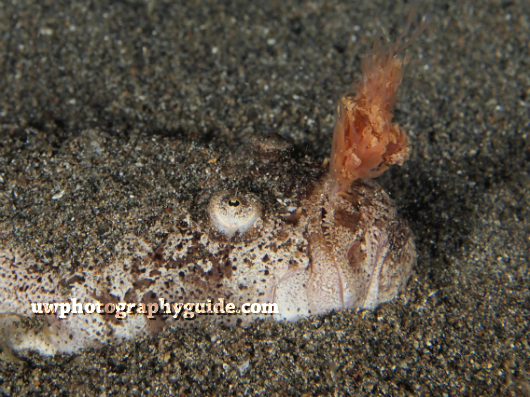 On the one hand, the flipflop represents tremendous volumes of garbage overwhelming the oceans; on the other head, in this specific instance, it also represents shelter for the filefish, something which might actually help the fish survive. 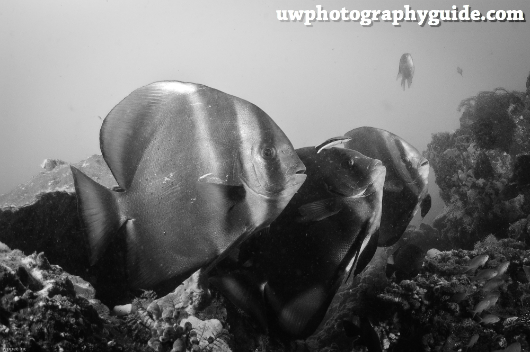 Few things, in other words, are entirely black-and-white, light-or-dark. I immediately thought of War of the Worlds, an alien invader launching probes or spores, leaning in to image left for sinister effect. I know, I probably read too much SciFi when I was younger, but I love the shot. One of my favorites because...well...wow. Wish I had been there. 1. Don't put your copyright on submissions. If I see your name on the shot, it's disqualified. Period. 2. Avoid fads. Just because some place, subject or photographic tool is popular doesn't mean it's good. Quite often, just the opposite. The story: ” I got this picture last may, in Tenerife, Canary Islands. It was in the afternoon, I was with a group of friends and my girlfriend taking pictures of pilot whales. We saw in the distance, there was forming a big group of shearwaters and seagulls,countless in numbers. Underwater there were many spotted dolphins. 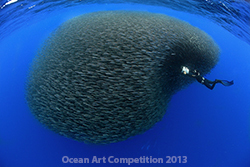 The baitball would spin and spin but not move apart, all the time changing its shape. 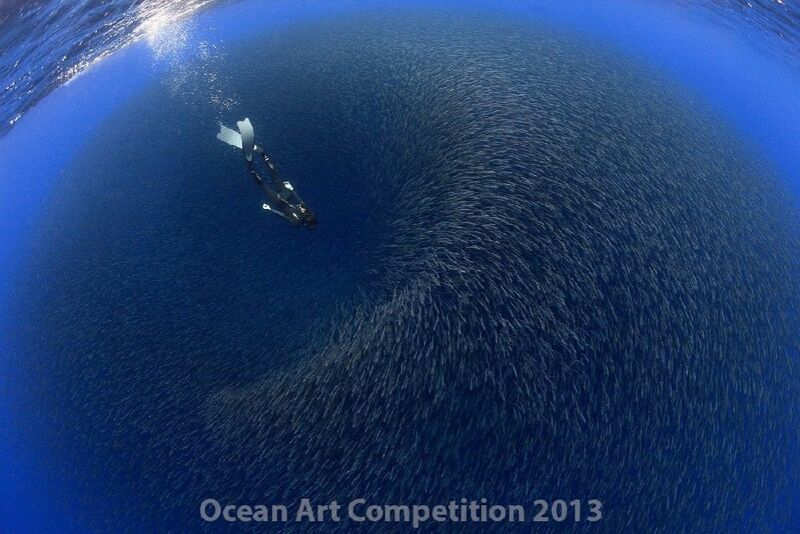 Dolphins, shearwaters, and seagulls attacked the group of fish, and it changed shape . When the scene was quiet, my friends and myself tried to get pictures and video of the movement. My girlfriend is an excellent swimmer and freediver and I told her to dive near the ball. It wasmy chance to get thispicture. "The photograph was taken near Ekaterinburg, Russia. Lazurny is an old neglected quarry, totally filled with ground waters. 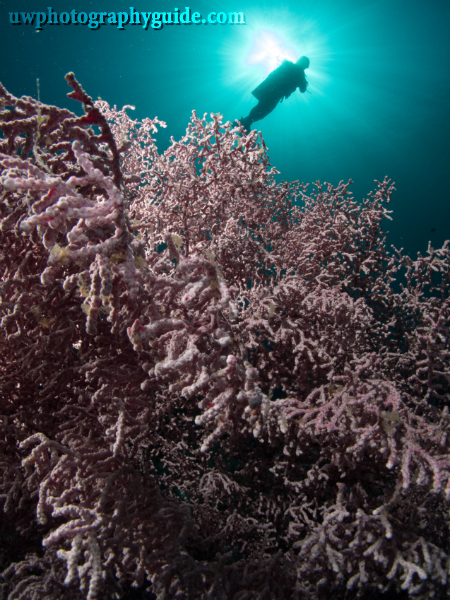 Pine trees and bushes on its bottom remain green for many years underwater. In winter the quarry is covered with thick ice and snow. 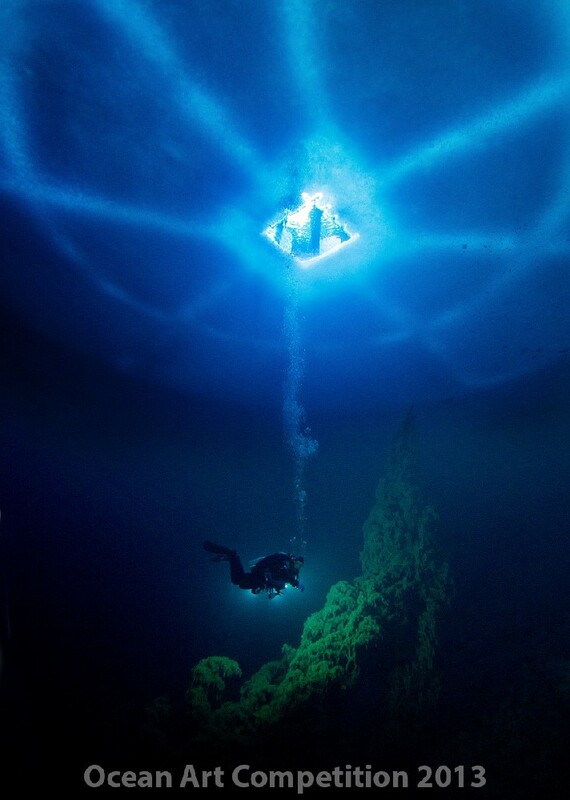 The circles and rays on ice “sky” are manmade. According to Russian ice diving standards the snow should be removed from the ice in such strange manner to let divers orientate themselves beneath the ice and easily find their way back." Honorable Mentions are in no particular order. Winners get only 1 prize based on totalling points from all their winners photos, and winners had ranked their prize choices. 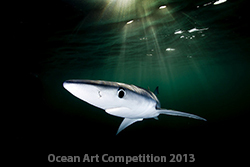 Special thanks to Tony Wu, Martin Edge, Marty Snyderman, Scott Gietler and Todd Winner for judging the competition. Read the judges' comments. SPECIAL THANKS TO OUR SPONSORS FOR PROVIDING OVER $80,000 IN PRIZES! 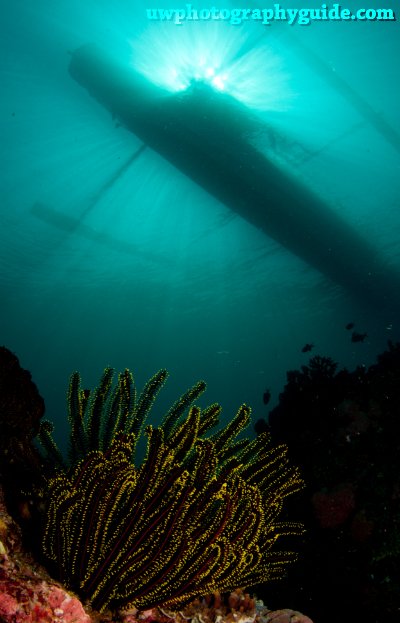 The liveaboard MV FeBrina, one of the most famous liveaboards in the world, cruises from her home port, Walindi, visiting areas further afield such as Witu Islands, Fathers Reefs - some of the best diving on the planet. 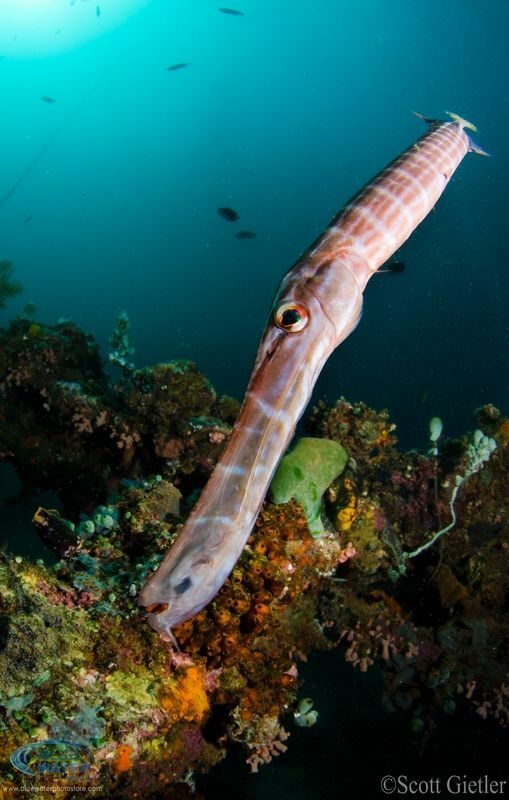 The MV FeBrina is sponsoring a 10-night liveaboard trip as part of an 18 night dive trip package including 4 nights at Walindi resort and 4 nights at Loloata resort. The M S/V WAOW offers divers fourteen dream destination itineraries through Indonesia on their 60m ironwood sailboat, complete with 9 luxury staterooms, spacious lounges, full service restaurant, dedicated camera room, sundecks, multimedia equipment and more. 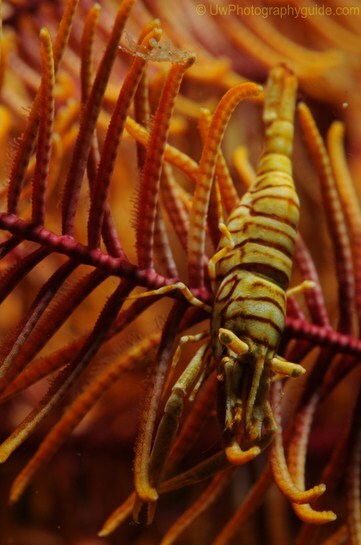 Experience some of the best diving in the world on a luxury cruise, including Komodo, Alor, Raja Ampat and more. 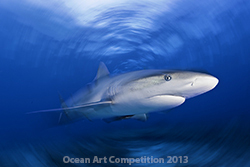 WAOW Charters is sponsoring a trip of the winner's choice! SMY Ondina, a romantic and modern wooden schooner, runs fantastic Indonesia liveaboard adventure safaris to dive Komodo, Fak Fak, Flores, Sulawesi and the Raja Ampat area - some of the most amazing waters in the world. Eight air-conditioned double cabins with en suite bathroom guarantee a level of comfort you’ll appreciate. 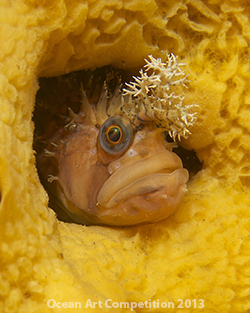 The SMY Ondina is sponsoring an 11 day trip on their liveaboard for ANY of their scheduled cruises + 50% off your companion! 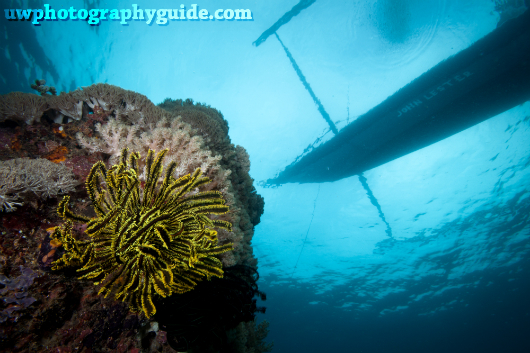 The S/Y Indo Siren is an award-winning yacht visiting some of the world's top-rated dive sites with comfort and ease. Owned and Managed by Worldwide Dive & Sail, the S/Y Indo Siren was built for divers by divers with flexible cabin arrangements, outdoor dining area and extra spacious dive deck. 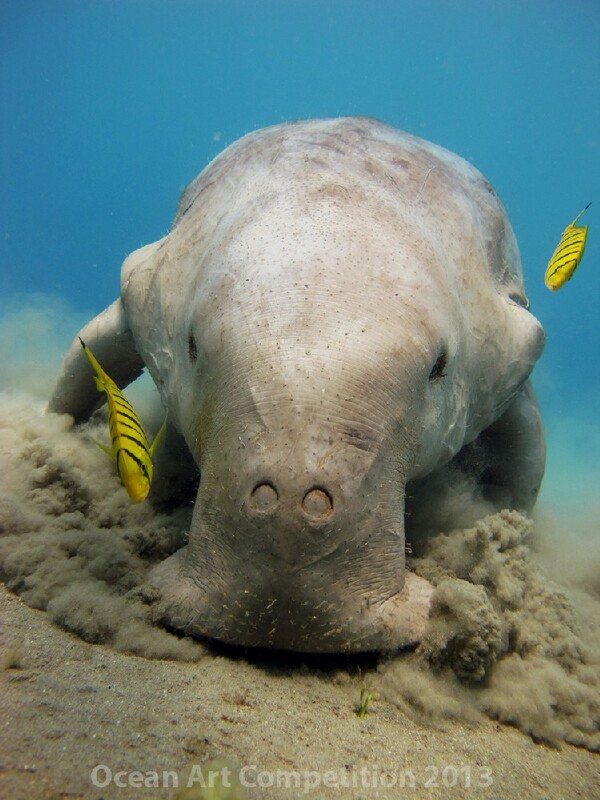 The S/Y Indo Siren is sponsoring a 10-Night Komodo Trip! 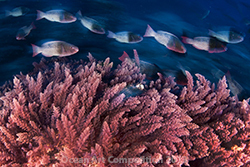 Oceanic builds innovative and reliable scuba products. 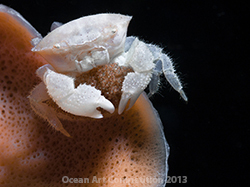 Underwater photographers demand a lot from their equipment to get the perfect shot and Oceanic continues to live up to the challenge. 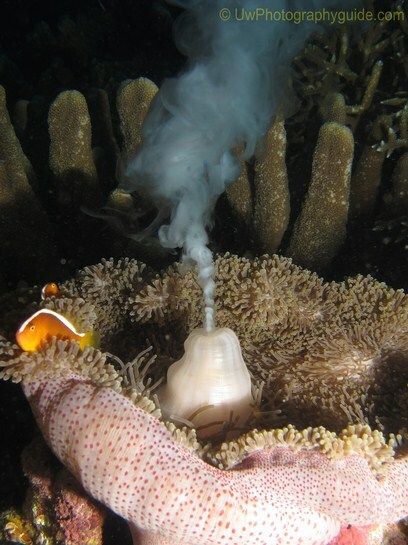 The new OCi represents the next step forward in recreational wireless air-integrated dive computers. 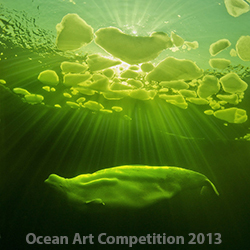 Oceanic is sponsoring 4 OCi computers for various Ocean Art winners! 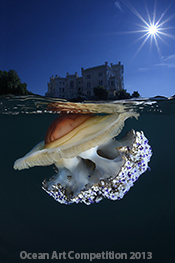 Bluewater Photo is the premier online and retail shop for underwater photography gear as well as international photo trips. Offering years of experience and expert advice on cameras, housings, strobes and accessories, Bluewater Photo is known for excellent customer service during and after sale. 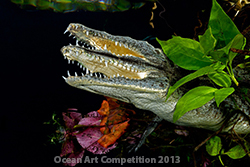 Bluewater Photo is sponsoring a $100 gift certificate for every contest winner! 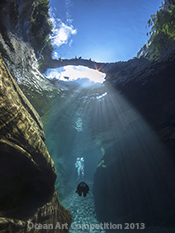 Bluewater Travel is a full service dive travel agency covering over 100 of the top resorts and liveaboards worldwide. 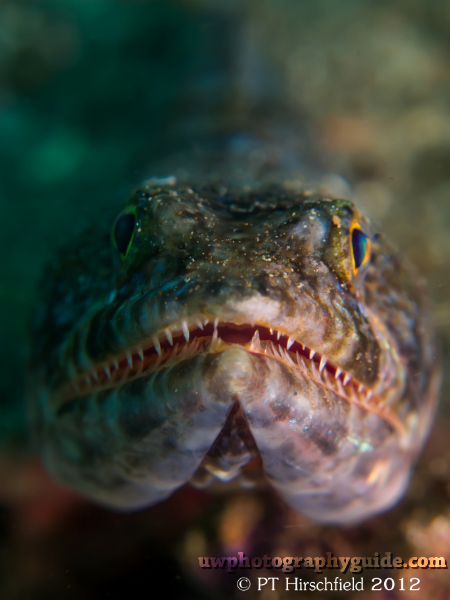 Run by divers for divers, Bluewater Travel specializes in photo excursions and sets divers up to capture their best photos. Bluewater Travel is sponsoring trip credits with any of our 100 partners for winning photographers! Some consider Lissenung Island Resort the ultimate paradise. 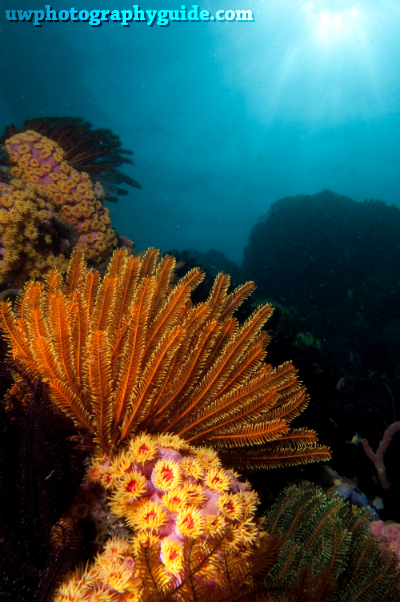 Imagine a small tropical island covered in palm trees, surrounded by a white sandy beach, a beautiful house reef and some of the best diving in the world. 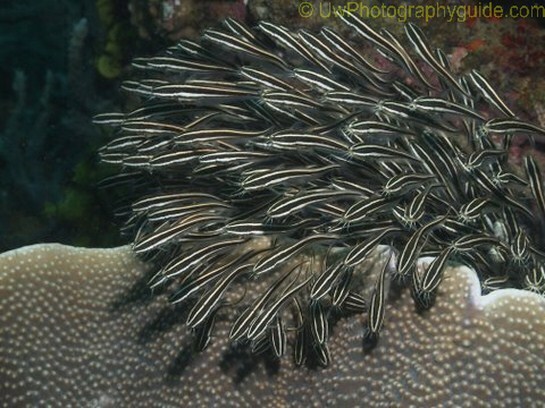 Lissenung Island is located just off Kavieng, New Ireland Province, Papua New Guinea. Nestled amongst natural surrounds, traditionally built bungalows accommodate a max. of 14 guests. Forget your high heels, tropical attire is our dress code. At Lissenung Island Resort, personal service is guaranteed and a visit here is truly exclusive! 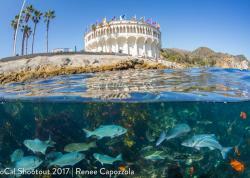 Lissenung is sponsoring a 10 night stay at their resort + diving! 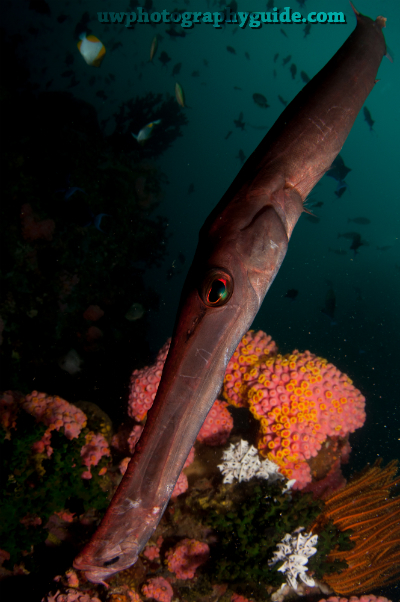 Bilikiki offers liveaboard dive trips in the Solomon islands, from ships consistently rated among the best live-aboards in the world, with some of the best diving in the world. 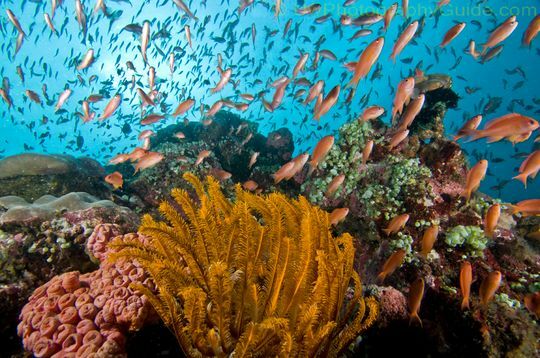 You'll have a good opportunity to see sharks, mantas, dolphins, and turtles, barracuda, and more varieties of coral than almost anywhere. Bilikiki is sponsoring a 7 night trip on any of their liveaboards! 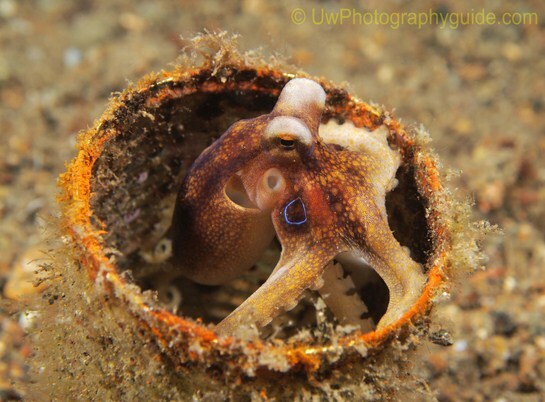 The Nautilus Swell brings over 20 years experience in B.C. and Alaska, along with the same crew, exceptional service levels and attention to detail that the Nautilus Explorer is famous for. 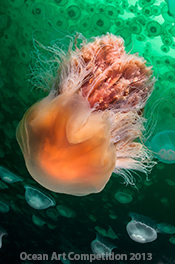 Explore calving glaciers, iceburgs, grizzly bears, giant wrecks and more. 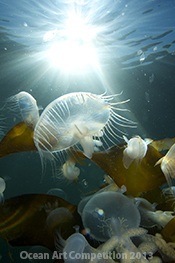 The Nautilus Swell is sponsoring a 1 week trip to British Columbia / Gwaii Haanas! Villa Markisa is an exclusive resort located on the north east coast of Bali. Nestled at the foot of Bali’s most famous volcano “Gunung Agung”, the private bungalows offer individual service and great attention to detail. 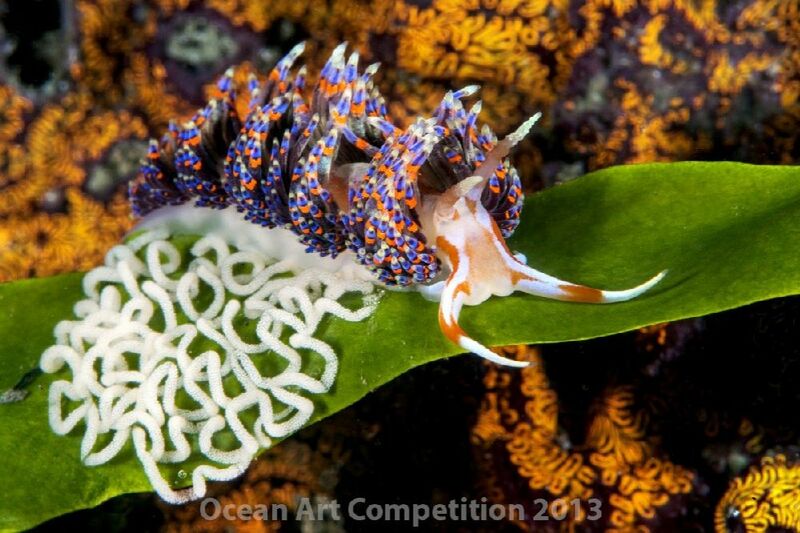 Bali's famous Liberty Wreck is minutes away, and the house reef has hundreds of nudibranch species. Villa Markisa is sponsoring a 7-night stay in the deluxe bungalow, full board, and diving! 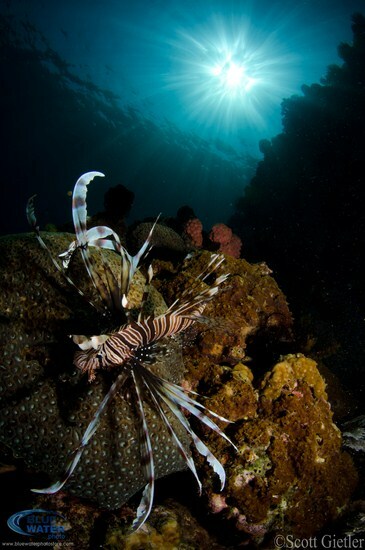 Sea Safari Cruises, based in Bali, takes divers on trips to remote destinations like Lembongan Island, Labuan Bajo and several other well-known diving locations. 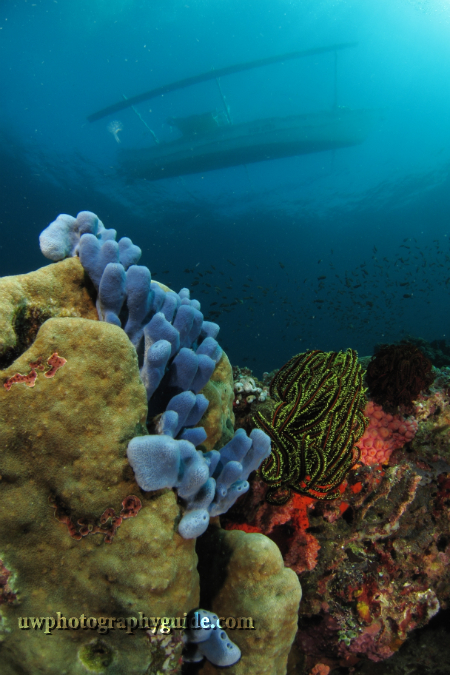 Known for excellence in service, food, music, ambience, attentive crew, exclusivity and great diving, Sea Safari offers a unique liveaboard experience. 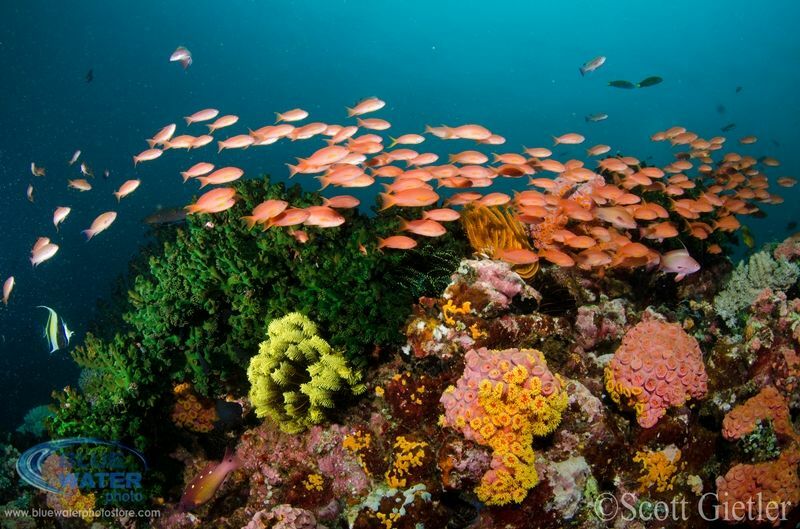 Sea Safari is sponsoring a Raja Ampat or Komodo liveaboard trip! Kosrae Island is truly a hidden treasure, tucked away in the Federated States of Micronesia on top of some of the most lush and healthy coral reefs in the world. 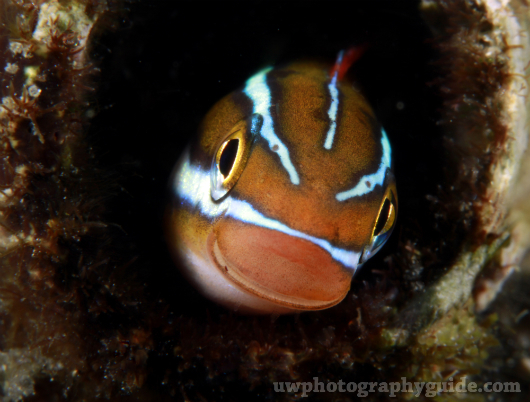 Kosrae Nautilus Resort caters to divers who are looking for remote, uncrowded, pristine reefs. 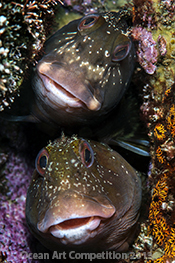 They offer complete dive, accommodations and meals packages. 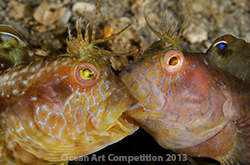 Kosrae Nautilus resort is sponsoring a week-long dive vacation for 2 divers! 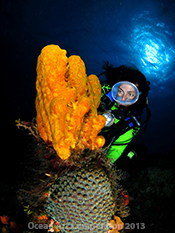 Atlantis Dive Resorts offer one of the most outstanding values for a first class dive vacation in the world today. 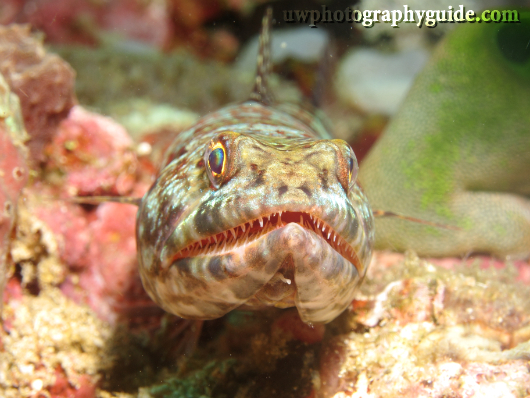 Experience Atlantis' luxury liveaboard (Atlantis Azores) or visit resorts in Dumaguette and Puerto Galera, Philppines. 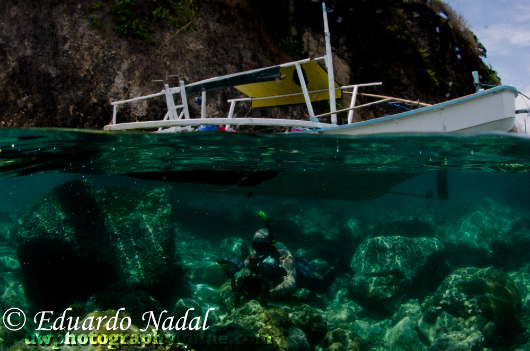 Atlantis Dive Resorts is sponsoring a 7-night dive vacation at either Atlantis Puerto Galera or Atlantis Dumaguete! 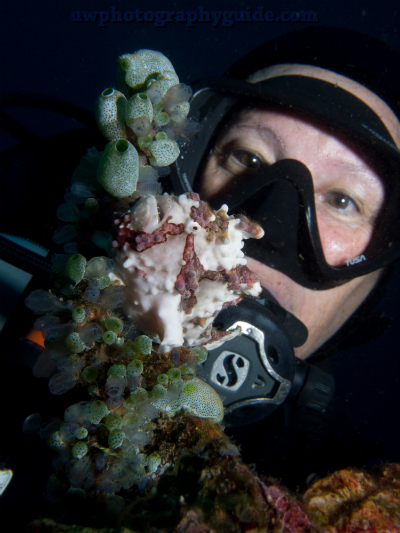 Since 1969 Mike Ball has been setting standards in the Australian dive industry with exceptional liveaboard expeditions to the Great Barrier Reef and Coral Sea. 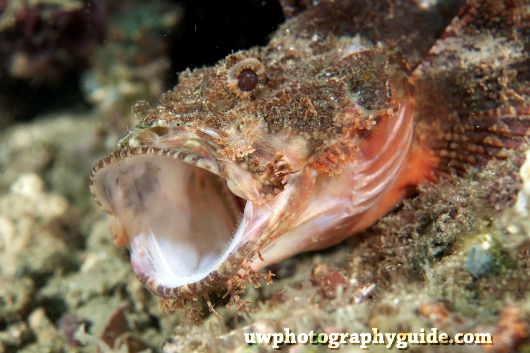 Mike Ball is sponsoring a 3-night Fly Dive Cod Hole expedition! 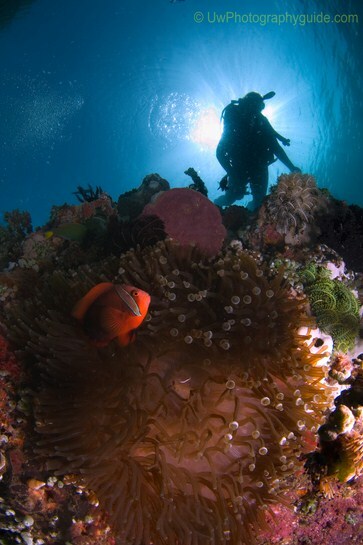 Walindi Resort, in Kimbe Bay Papua New Guinea, has been voted to have the "best diving from a resort anywhere in the world" by reader surveys. 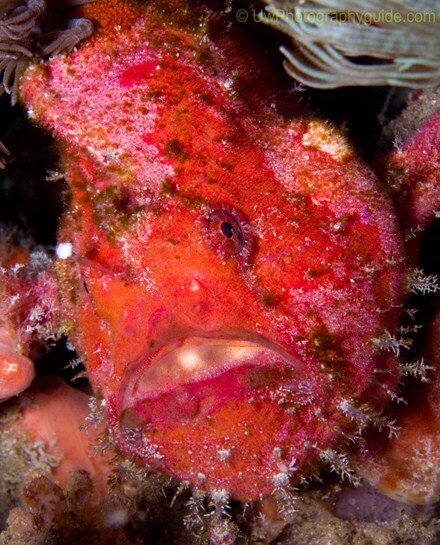 Unusual critters, 900 species of fish, sharks, barracuda, jacks and more await you. 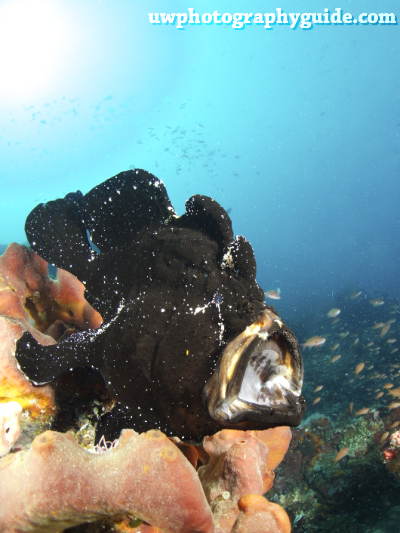 Walindi is sponsoring a 4-night stay as part of an 18 night dive trip package including 10 nights on the MV FeBrina and 4 nights at Loloata resort. 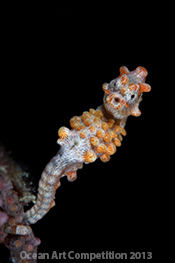 Alor Divers is situated on a large white sand beach just minutes from world-class Indonesian diving. Slopes and walls full of coral, fish and seasonal whales await divers, as well unlimited house reef diving in front of the intimate resort. 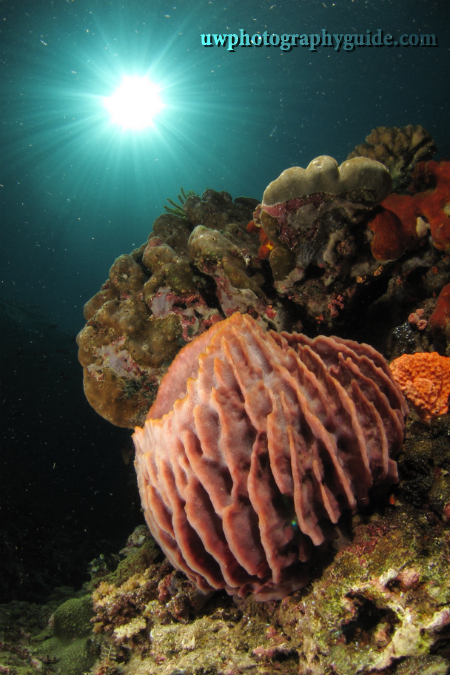 Alor Divers is sponsoring a 9-night dive and stay package! 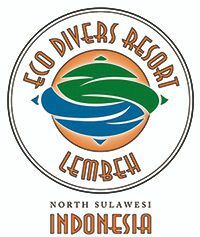 Eco Divers is the only Indonesia resort offering liveaboard diving by day with a resort stay by evening for a truly unique dive experience. 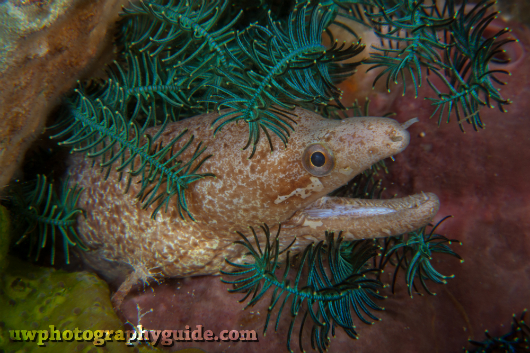 Catering to underwater photographers, Eco Divers visits some of the best reefs in the world. 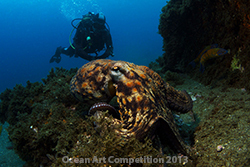 Eco Divers is sponsoring a 7-night stay and dive package! Winner must bring a buddy at standard rates. 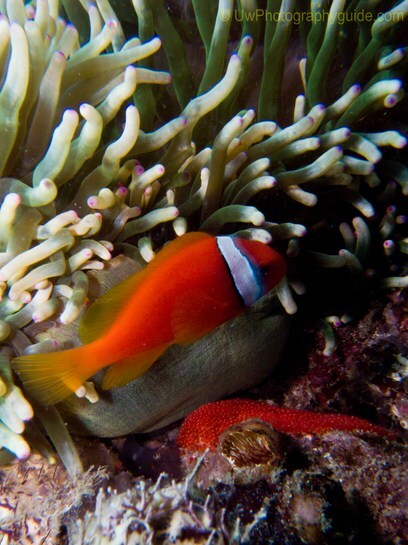 Loloata Island Resort, just minutes from the Port Moresby airport in Papua New Guinea, means great diving and a chance to observe some of the world's greatest coral reefs and meet a myriad of marine animals in their natural habitat. 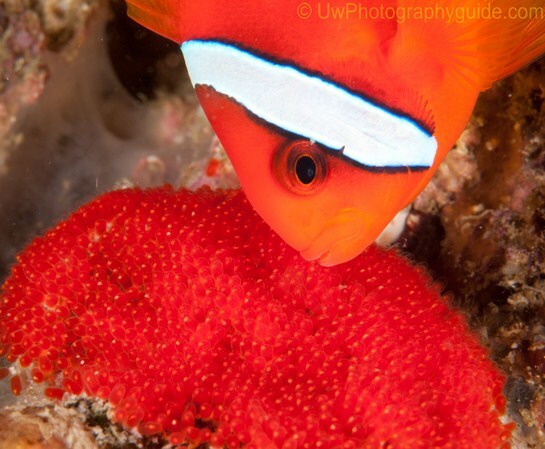 Underwater photo enthusiasts find a dazzling array of great fish, corals and invertebrate subjects only minutes away from the dock aboard a new deluxe dive boat. Loloata is sponsoring a 4-night stay as part of an 18 night dive trip package including 10 nights on the MV FeBrina and 4 nights at Walindi resort. 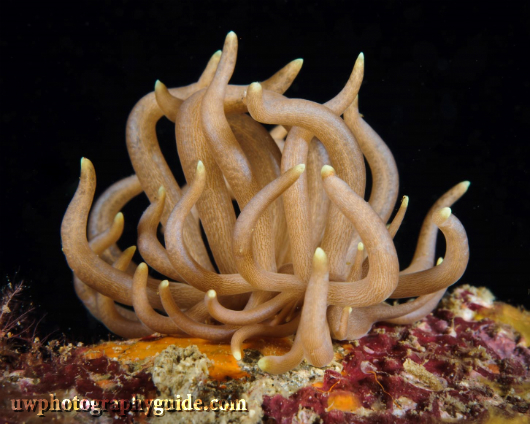 Ikelite has a long history of making strobes, dive lights, underwater housings for DSLR and compact cameras and much more for photographers worldwide since 1962. They're famous for their commitment to excellent customer service. Ikelite is sponsoring a DS161 Substrobe with charger and a new Gamma dive light! Lions Dive & Beach Resort is the sportiest place to stay in Curacao, located minutes away from some of the Caribbean's best diving. 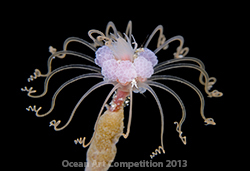 Enjoy their large pool, spa, or lounge on a gorgeous beach in between dives. Lions Dive is sponsoring a 5-night stay for two with breakfast included! 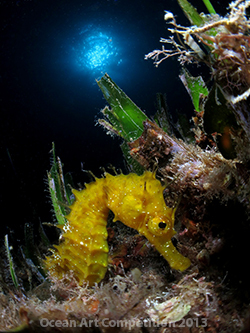 AquaMarine Diving Bali is well known for specializing in custom Bali dive safaris for divers and underwater photographers. They offer fast boats, great accommodation options and experienced guides that know where all the best photo subjects are. 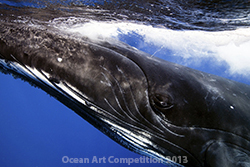 AquaMarine is sponsoring a 5-day trip for an Ocean Art winner! Juliana's Hotel paired with Sea Saba Dive Center is your paradise in the Caribbean. 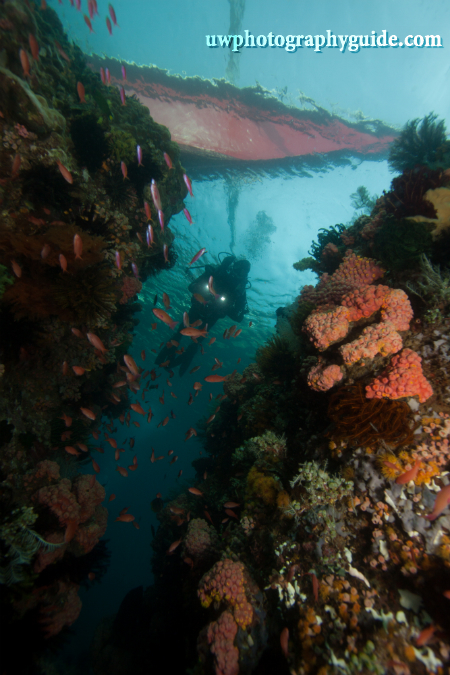 Sea Saba offers unspoiled diving with no cruise ships along with a variety of accomodations (including cottages) at Juliana's. They pride themselves on the highest levels of service. 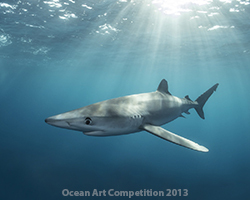 Juliana's and Sea Saba are sponsoring a 3-night trip with diving for an Ocean Art winner! 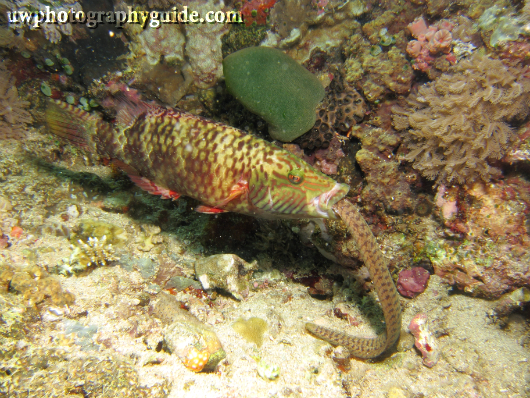 The Maluku Divers Resort in Laha is one of the must visit locations in any diver’s Indonesian dive list. 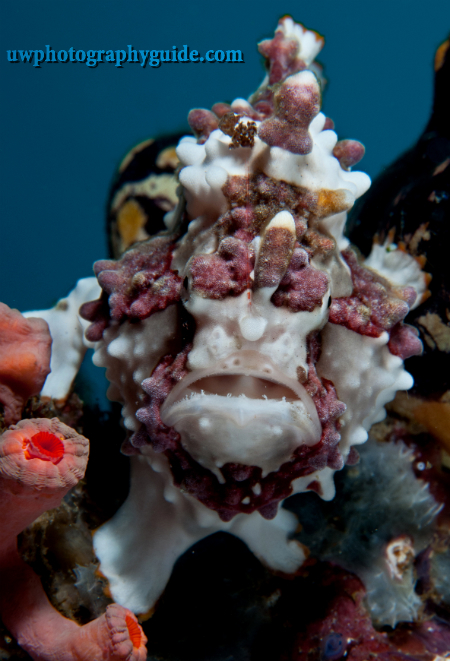 The only dedicated dive resort in Ambon, the facility was built specifically with divers in mind and boasts the most unique and comfortable accommodations in the whole of Maluku. 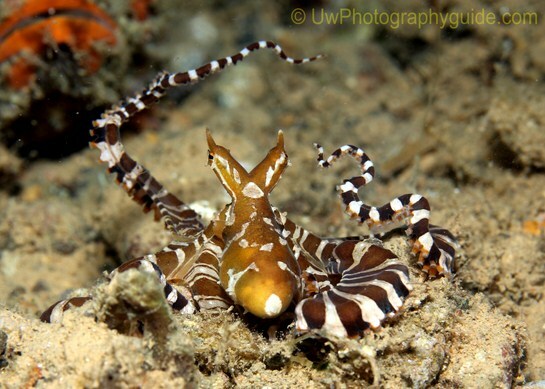 Maluku Divers Resort is sponsoring a 4-night package complete with diving! 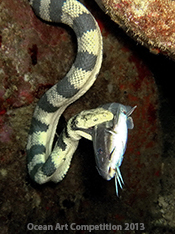 Blackbeard's Cruises offers liveaboard scuba vacation packages to the Bahama's outer islands, along with a huge variety of diving - sharks, walls, reefs and more. 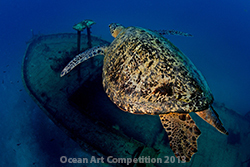 Blackbeard's is sponsoring a week-long liveaboard! Acquapazza is the first u/w housing manufacturer to offer high-quality metal housings in 14 annodized colors. Stylish in design with excellent ergonomics, these housings are made with decades of manufacturing expertise in high-end motorcycle racing components. Acquapazza is sponsoring a violet housing for the Sony RX-100! 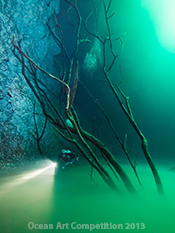 I-DiveSite produces the innovative I-Torch dive, video and focus lights. 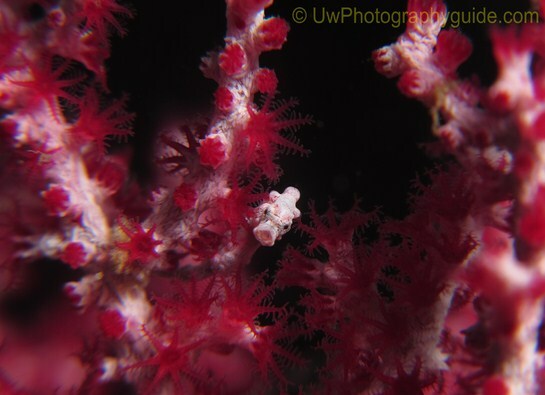 With a wide range of lights featuring white, red and even UV beams, I-Torch lights are a favorite of many underwater photographers and videographers. I-DiveSite is sponsoring a Pro6 Video LIght! Recsea is the manufacturer of some of the finest, most compact aluminum housings on the planet - known for their light weight, precise controls and excellent ergonomics. Recsea is sponsoring a housing for the popular Sony RX100 camera! 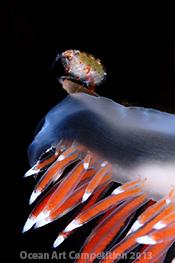 ReefNet has been developing unique marine technologies for more than 15 years and have earned a great reputation with photographers through their SubSee magnifiers. Their products combine smart engineering with elegant design, solving problems with style. 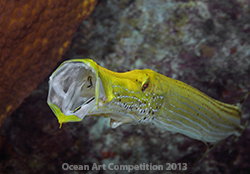 Reefnet is sponsoring a +5 or +10 SubSee diopter and adapter for supermacro photography! 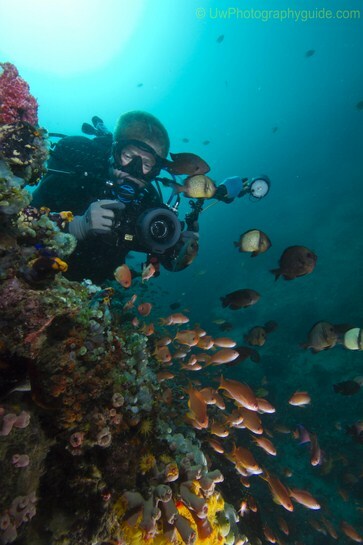 Sea & Sea is one of the best known names in underwater imaging equipment, offering high-quality DSLR housings, strobes and much more. Sea & Sea is sponsoring a YS-01 strobe! 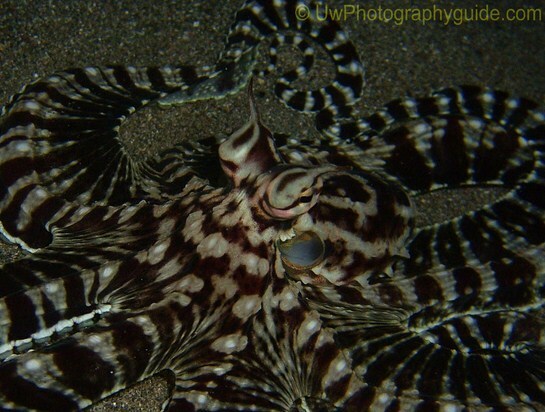 Kona Honu Divers is locally owned and operated with excellent and experienced guides. 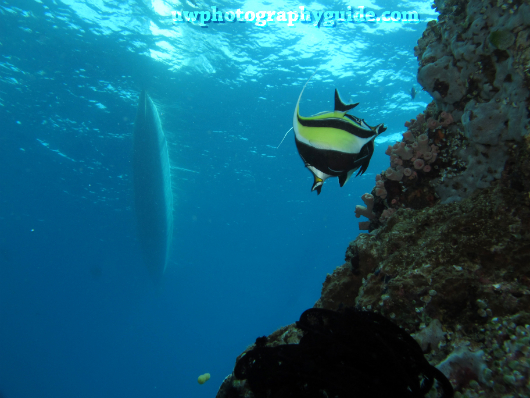 Encounters with dolphins, turtles, and manta rays are common in the placid Kona waters. 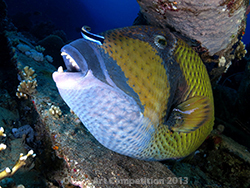 Kona Honu Divers is sponsoring 3 separate 2-tank dives, perfect for your next Kona vacation! 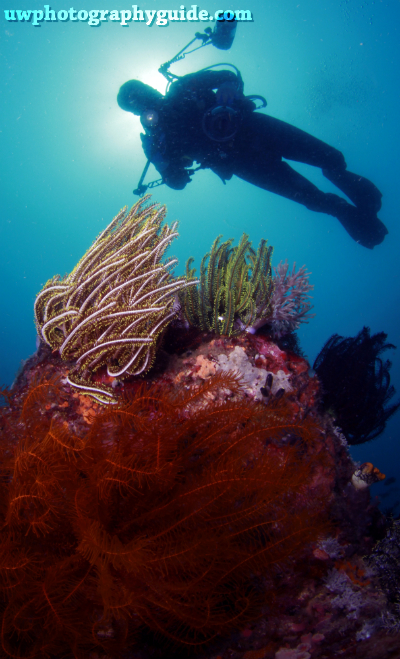 SUBGEAR manufactures quality dive gear for reasonable prices, and is one of the leaders in regulators, BCs, wetsuits, masks, fins and many other dive products. Subgear is sponsoring an XP-10 2-Gauge Console! Diving Unlimited is known worldwide for making drysuits and undergarments of the highest quality, built specifically for each customer in San Diego, California. 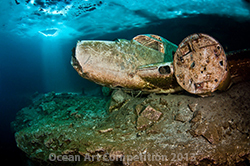 DUI is sponsoring a weight & trim package and dive gear bag! GoPro produces the world's most versatile cameras that can mount everywhere. 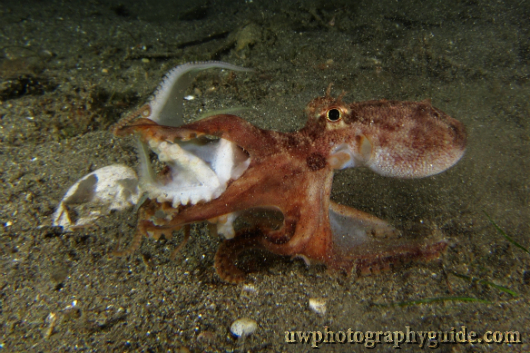 The Hero 3 Black camera records incredible HD video and has become a favorite of many divers. GoPro is sponsoring a Hero 3 video camera! 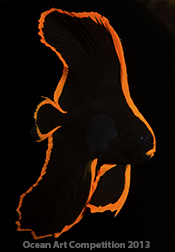 Fantasea Line is dedicated to developing and manufacturing creative and affordable products for diving and underwater photography. 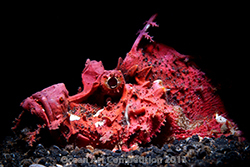 Fantasea makes a popular housing for G15 camera as well as many exellent dive lights. Fantasea is sponsoring a BlueRay Action Video Light! 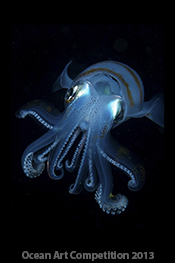 SeaLife Cameras are packed full of features at very affordable prices. 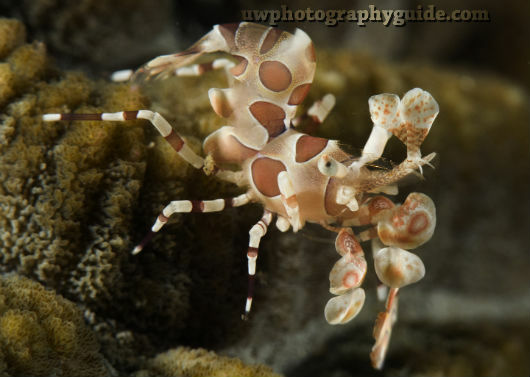 Great for snorkeling or scuba diving, and shooting photos or video. 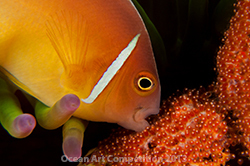 SeaLife is sponsoring a ReefMaster camera! Watershot creates underwater housings and lighting and has become wildly popular for their iPhone housings. Watershot is sponsoring an iPhone 4 or 5 PRO housing! ThinkTank Photo is a leader in creating great products for photographers. They specialize in camera bags, travel bags, belts, covers and more. 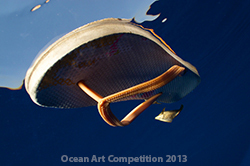 ThinkTank is sponsoring a Retrospective 7 camera bag for an Ocean Art winner! Ultralight is the leading maker of arms, trays and clamps for the underwater photography community - making only high quality products built to last. Ultralight is sponsoring a gift certificate to help build your camera rig! 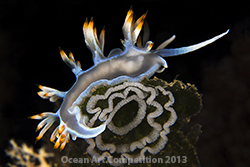 Announcing the 2013 Ocean Art Photo Competition, brought to you by the Underwater Photography Guide. 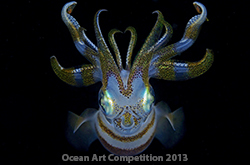 Submission Period Ended Nov 17, 2013. 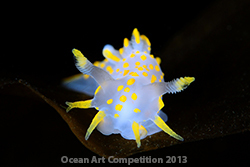 Follow the Underwater Photography Guide on Facebook for updates on the 2014 competition. Please scroll down to view our sponsors and the amazing prizes! 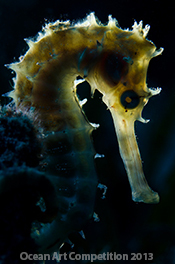 Bluewater Photo is the premier online and retail shop for underwater photography gear as well as international photo trips. Offering years of experience and expert advice on cameras, housings, strobes and accessories, Bluewater Photo is known for excellent customer service during and after sale. 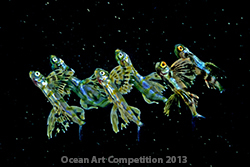 Bluewater Photo is sponsoring gift certificates for several contest winners! 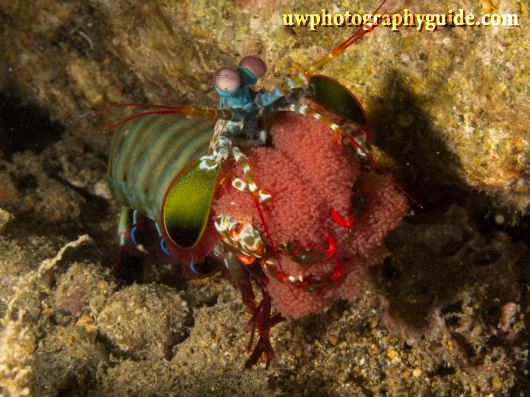 Another underwater photo trip has come and gone, but at least we can be reminded of our experiences by our amazing shots. 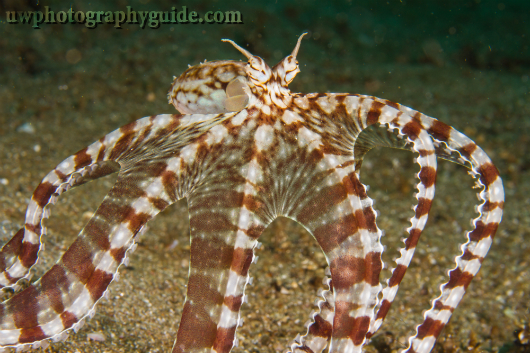 Anilao, Philippines is nothing if not home to some of the most unique and exceptional underwater creatures in the world, and we were able to find a wealth of them just begging to be photographed. 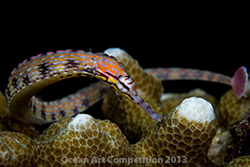 Below are the winners and honorable mentions from the second half of the Bluewater Photo & Video / UWPG Anilao 2012 workshop. These are some of the shots that particularly got our attention and can be applauded for exceptional technical skill and a great job of capturing the moment. Although we couldn't fit every amazing shot in this article, everyone on the trip was able to achieve photos to be proud of. 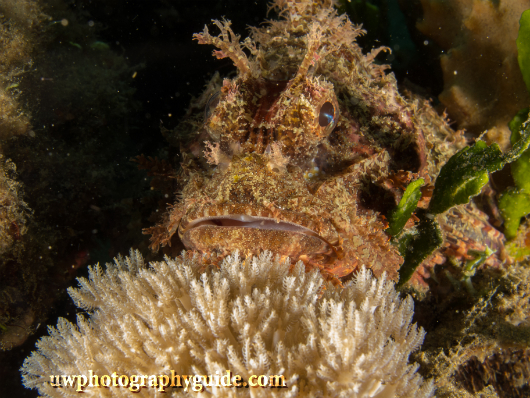 A big "thank you" to our dive masters for always pointing us in the right direction, to the wonderful Crystal Blue Resort for accommodating us, and to my fellow underwater photo pros Mike Bartick and Matthew Meier for their assistance and the effort put into their daily presentations. And of course, thank you to everyone who joined us and made the trip such a spectacular success. 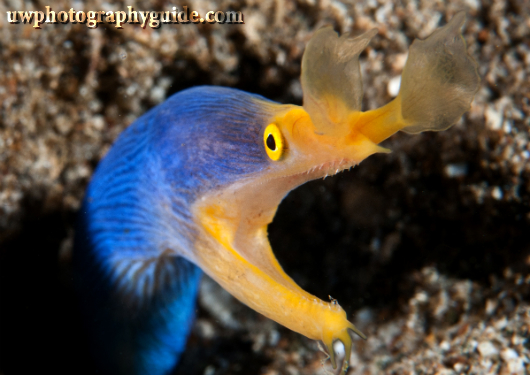 Be sure to sign up now for our Third Annual Anilao Photo Workshop, taking place in May of 2013! 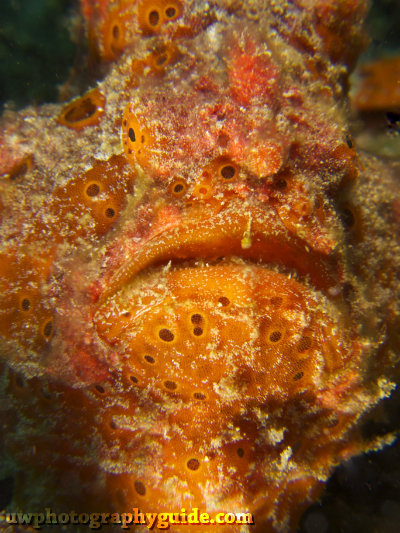 Many guests said that it was the best dive trip that they have ever been on. 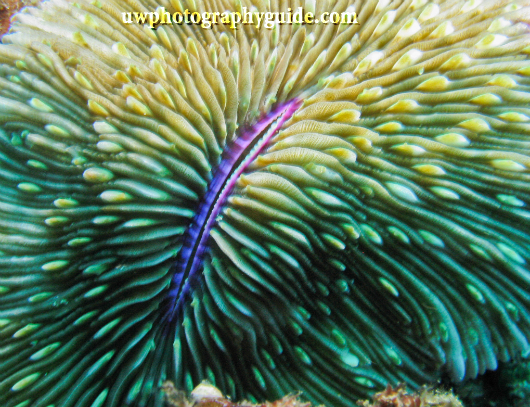 Please support the Underwater Photography Guide by purchasing your underwater photography gear through our sister site, Bluewater Photo & Video. Click, or call them at (310) 633-5052 for expert advice! 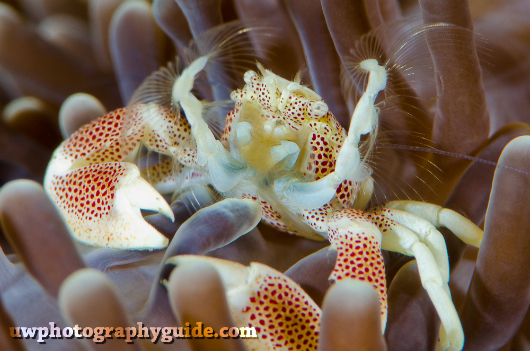 The best photos taken on the first leg of our 2012 workshop to Anilao, Philippines, in dSLR and compact. 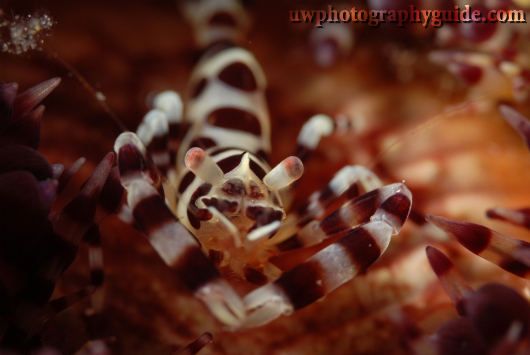 The second annual UWPG / Bluewater Photo Anilao 2012 Photo Workshop took place in two parts, one trip after another, at the Crystal Blue Resort in The Philippines. 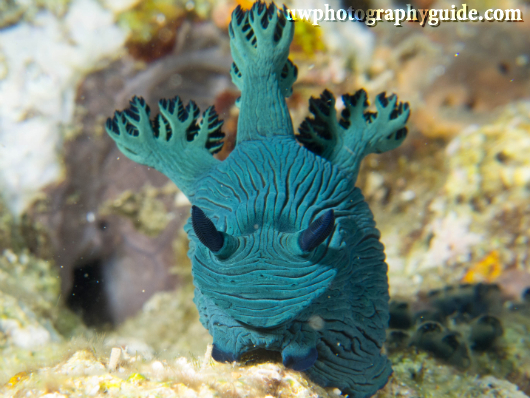 We dove four times a day in the incredible warm waters, searching for unique critters, and we were not disappointed. 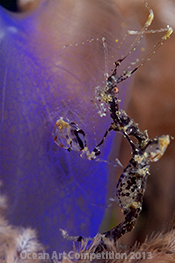 Rare and beautiful macro subjects lurked around every corner, and needless to say we got some great shots. Photo pro and trip organizer Scott Gietler and trip co-leaders Mike Bartick and Matthew Meier gave daily presentations on underwater photography technique, marine life and post-processing. Take a look at the best photos from our first trip! 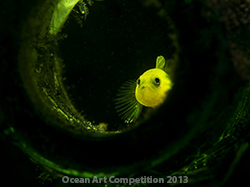 Here we have the winners for both dSLR and compact; macro, wide-angle, behavior and portrait. To read a few stories from the workshop, check out our trip testimonials. 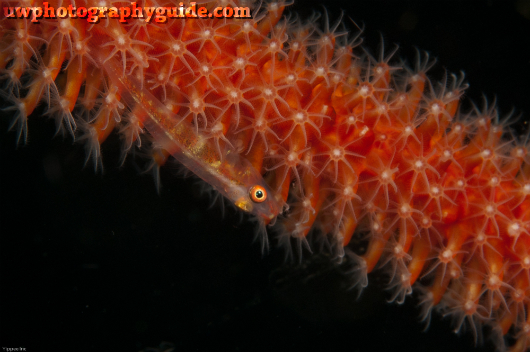 Also, be sure to sign up now for our Third Annual Anilao Photo Workshop, taking place in May of 2013! 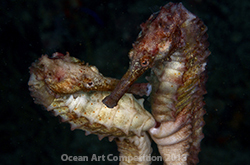 You can now see Part II of our Anilao shootout with more winning photos, here! The question is not what we saw, it is what didn't we see? We were met with blue-rings, mimic & wonderpus octopus, multiple Rhinopias, multiple hairy frogfish, dozens of non-hairy frogfish, dozens of seahorses, pygmy seahorses and ghost pipefish, mandarin fish, pregnant seahorses giving birth, mating flamboyant cuttlefish, bobbit worms, more than 1 mantis shrimp with eggs, a hundred species of nudibranchs, and endless varieties of shrimps & crabs. 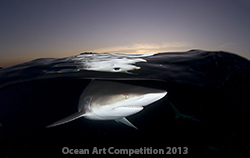 Congratulations to all the winners of the Second Annual Ocean Art Photo Competition! 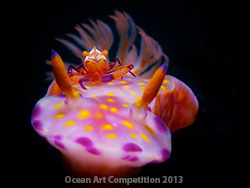 Congratulations to all the amazing underwater photographers! 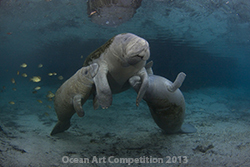 Underwater Photography Guide is proud to announce the winners for the Second Annual Ocean Art Photo Competition. 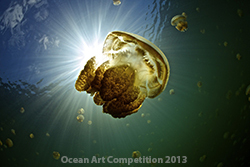 This year's Ocean Art Photo Competition represents entrants from over fifty countries! 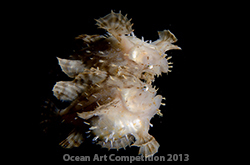 Judging was quite difficult due to the high quality of images. 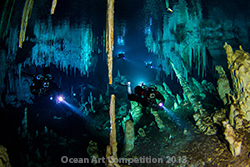 World famous underwater photographer and contest judge Martin Edge commented, "This year the judging was very tight due to so many superb images. After much discussion, agreements, and disagreements, we felt the winners really stood out. 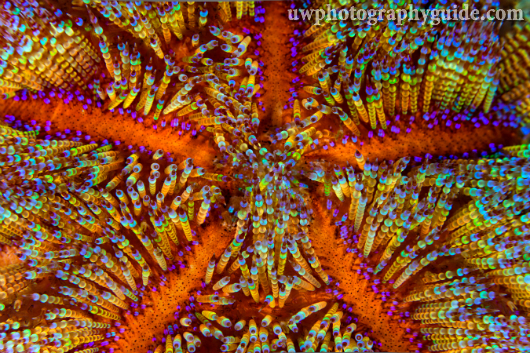 For myself, the best in show was the most awesome shot in the entire collection." 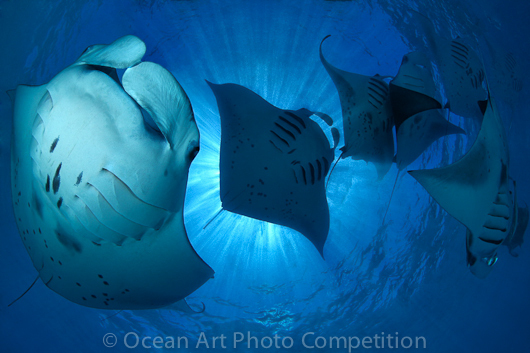 Thousands of entries were viewed by the judges before the final set of amazing images were selected, and deemed some of the best underwater photos in the world. 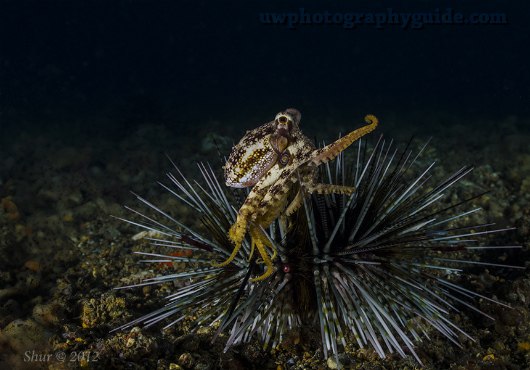 Winning photos from the May UWPG Anilao shootout competition. 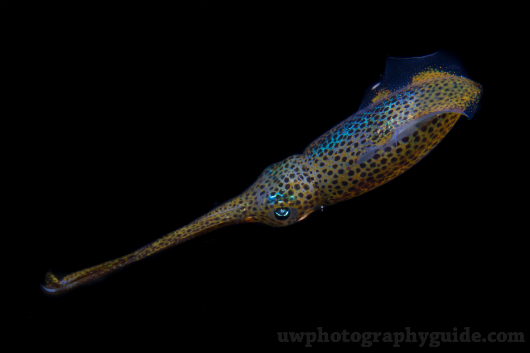 The 2011 Anilao workshop was a blast. 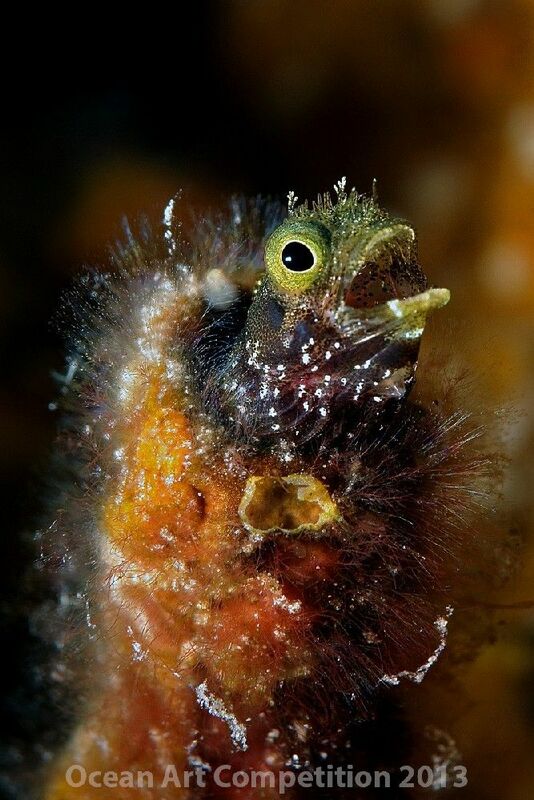 Twenty-five divers boarded six boats each day for some of the best macro and critter diving in the world, in search of Rhinopias, seahorses, ghost pipefish, frogfish and much more. No one was disappointed! Here's an online review that one of the participants wrote about the workshop. 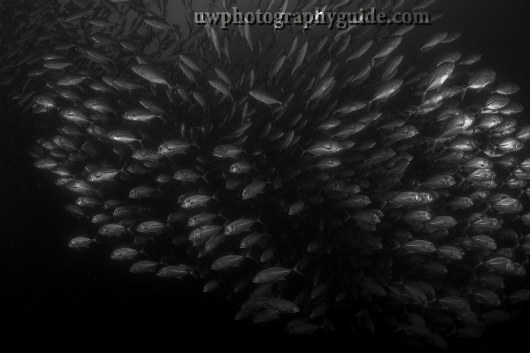 Most people shot macro on just about every one of the 35 dives, but there were a few wide-angle photos taken. 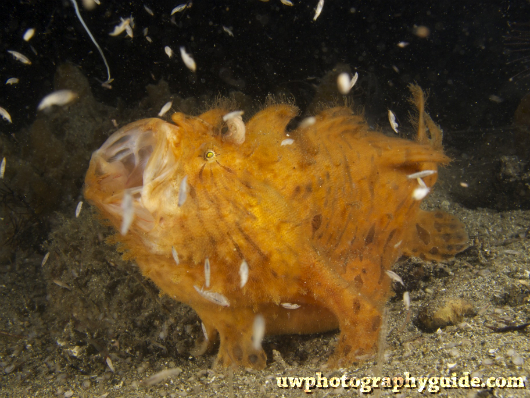 It's not that there weren't great underwater wide-angle ops, it is just that no one wanted to miss out on a great critter sightings! The workshop was May 20th through 30th. Crystal Blue Resort did a great job feeding us, filling our tanks with nitrox, and making sure everything ran smoothly, even when we had to launch from an alternate location one day due to bad weather. 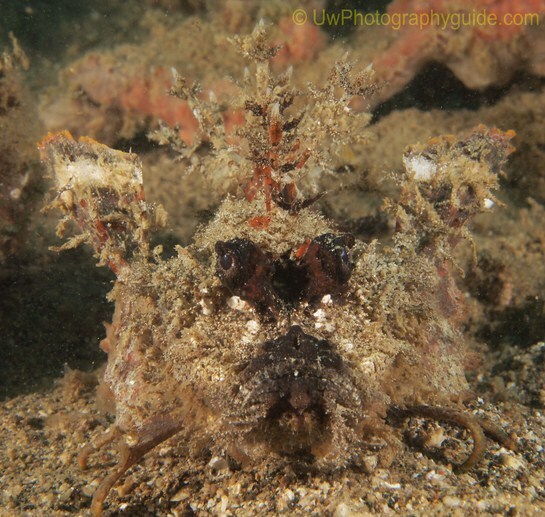 Critter sightings including everything imaginable - rhinopia, seahorses, pipefish, frogfish galore, bobbit worms, mimic & wonderpus octopus, stargazers, mantis shrimp with eggs, colmani shrimp, clingfish, bumblebee shrimp, harlequin shrimp, sawblade shrimp, soft coral crabs, flamboyant cuttlefish, many clownfish eggs, ambon scorpionfish, mushroom coral pipefish, squid, cuttlefish, sea snakes, leaf scorpionfish, cuckatoo waspfish, dragonets, mandarin fish, and so much more! Many thanks to all the participants, the dive guides, Mike Bartick who helped me run the trip, and resort owner Emma Bodota who personally flew over from the USA to make sure everything ran smoothly at the resort. Nice view from the resort. 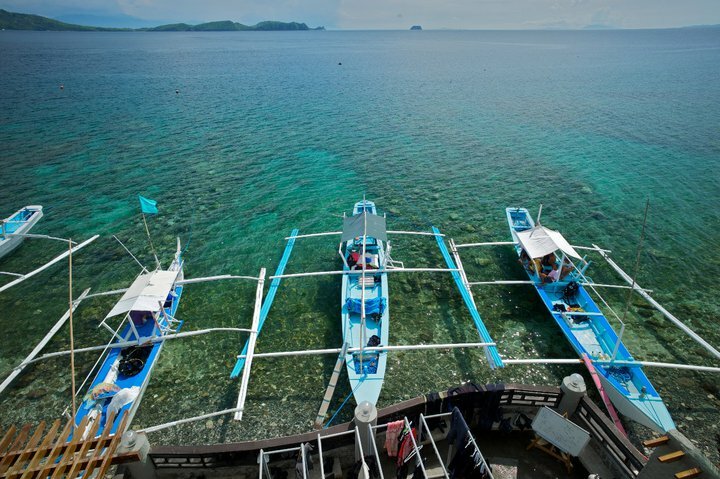 These are the jukong boats used to get to the dive sites, usually about 15 minutes away. Photo by David Yang. Stay tuned for part II of this article, a workshop photo essay from the trip leaders Scott Gietler & Mike Bartick. 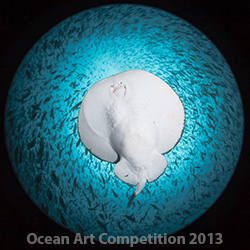 Congrats to all the excellent photographers! 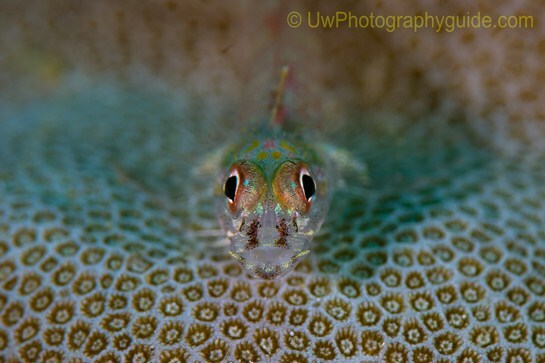 Goby on hard coral, 1st place in dSLR portrait category. Photo by Annika Persson. Nikon D80, F16, 1/125th, ISO 100, 105mm lens. 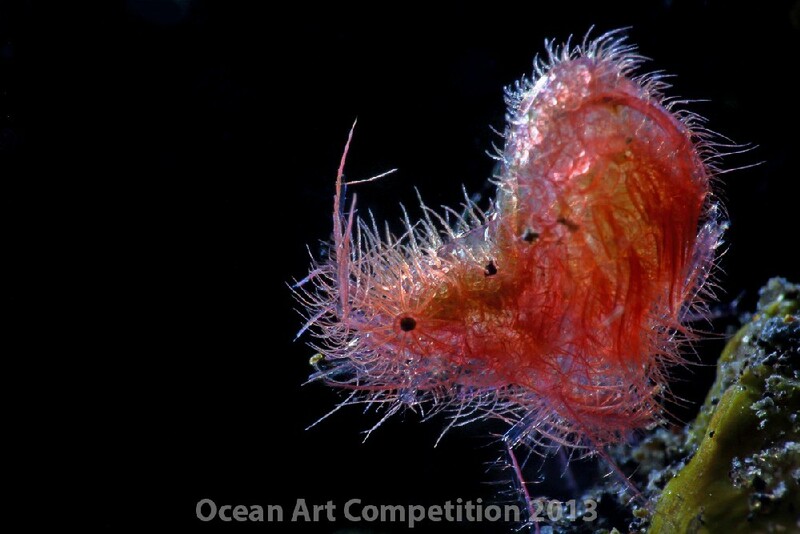 A special congrats to Annika for having so many winning photos in the competition. 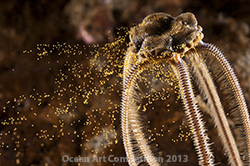 Crinoid shrimp, 1st place in dSLR macro category. Photo by Gabriel Se. Nikon D300. 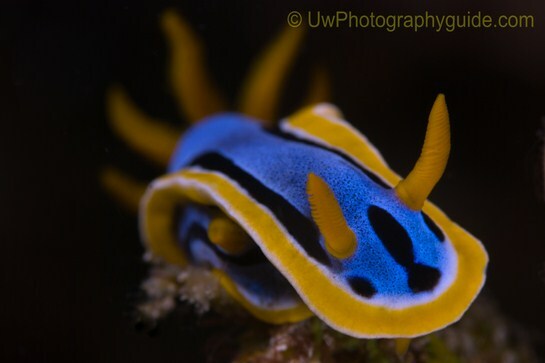 Chromodoris nudibranch, 2nd place in dSLR macro category. Photo by Annika Persson. Nikon D80, F14, 1/125th, ISO 100, 60mm lens. 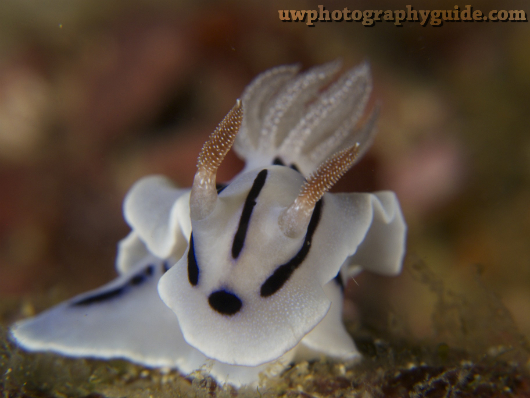 We saw well over 50 nudibranch species, although previously we've seen over 100. 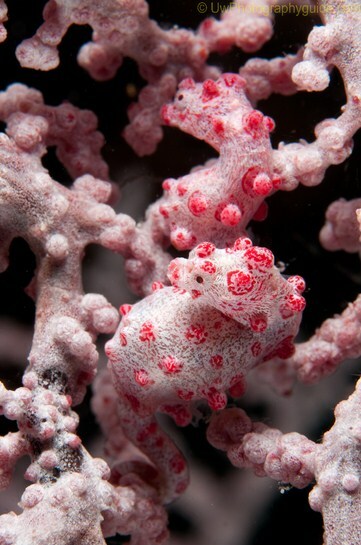 Pygmy seahorse, 2nd place in compact macro category. Photo by Ingrid Mollan Jensen. 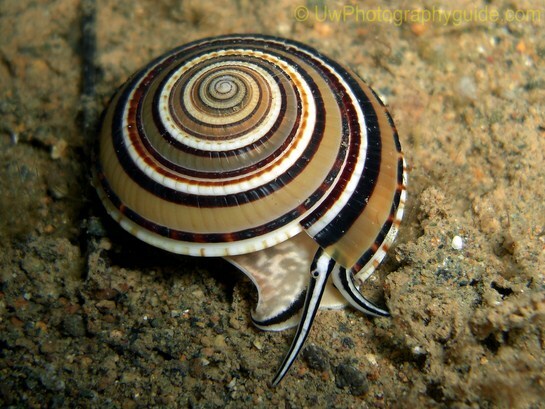 Canon G11, F4.5, 1/125th, ISO 80, Epoque macro lens. 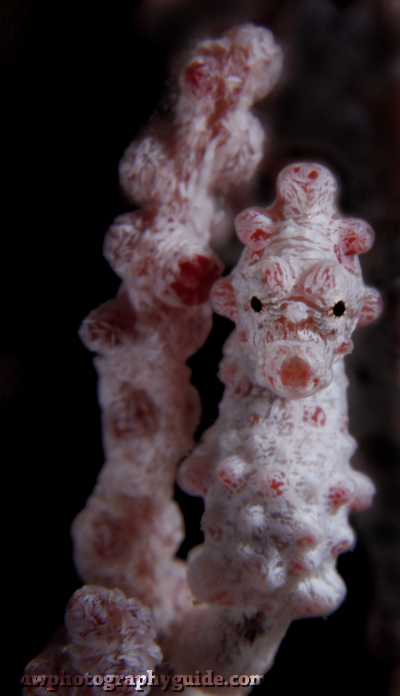 There were pygmy seahorses at 5 different dive sites. 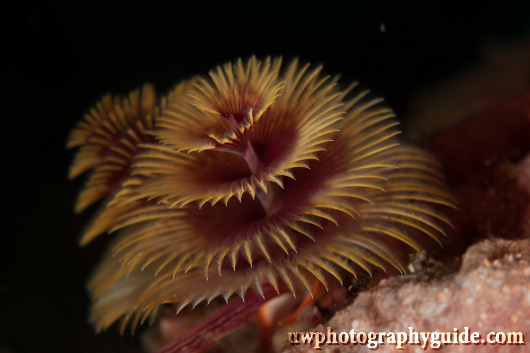 Spawning anemone near dusk, 1st place in compact behavior category. Photo by Ingrid Mollan Jensen. Canon G11, F4, 1/60th, ISO 80. 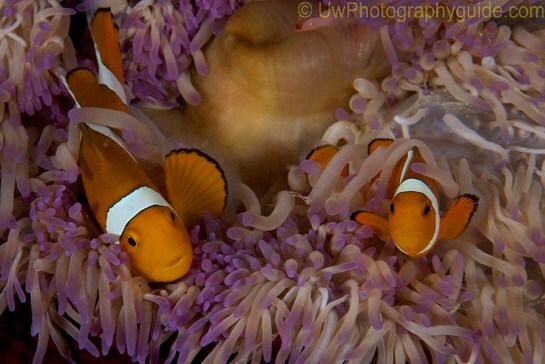 Publisher's note - definitely one of the most stunning photos from the trip imho! 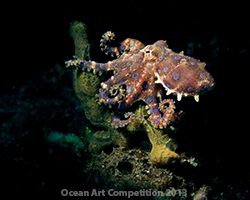 Wonderpus octopus, 3rd place in dSLR portrait category. Photo by Robin McMunn. Canon T2i, F9, 1/200th, ISO 100, 60mm lens. 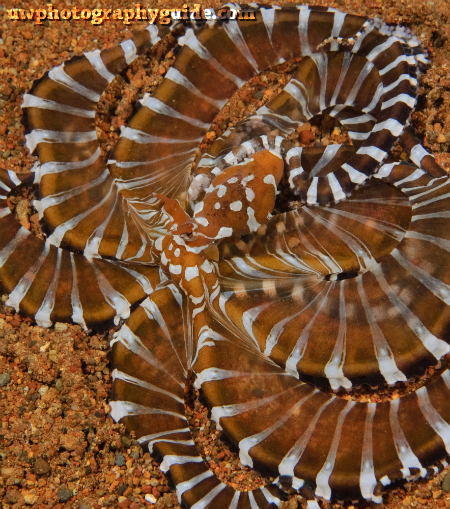 Pubishers note - I think almost everyone saw a mimic and/or wonderpus on this trip, expect for me! 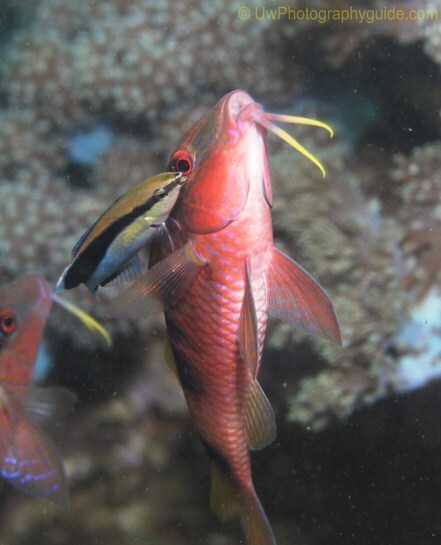 Anthias and Crinoid, photo by Robert Casagrande. Nikon D90, Tokina 12-24mm lens @12mm, F10, 1/60th, ISO 200. Robert had eggs for breakfast, which he says helped him get this nice wide-angle shot. 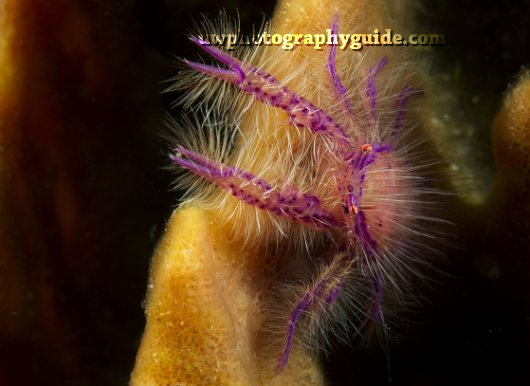 The 1st Annual Philippine Dive Seafari Event was recently held in the Philippines, designed to shine a light on a viable and sustainable way to attract dive tourism through underwater macro and critter photography. Industry delegates, journalists, photographers, and dive travel operators were invited from all over the globe to attend this first ever event to officially discover the diving in the Philippines. The group of delegates were split into four smaller groups and assigned to one of four distinct and different destinations. 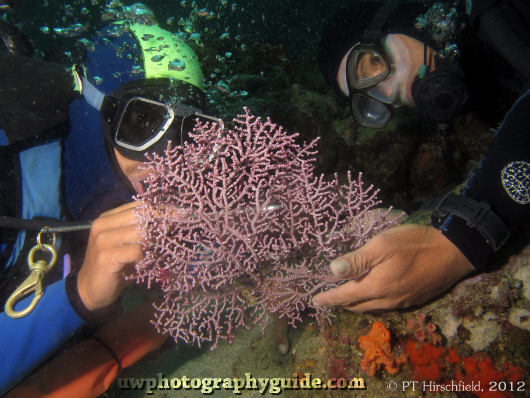 The assignment was to dive for five days, then tour historical sites for two more days before returning to Manila to report and document our experience and what each had discovered. 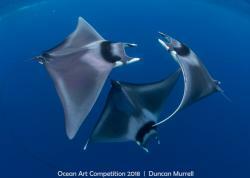 The Seafari Photo Competition was run in tandem amongst local non-professional underwater photographers and judged by some of the selected delegates. The competition was run shoot-out style over a two day period and included a great number of participants with a wide range of experience levels. 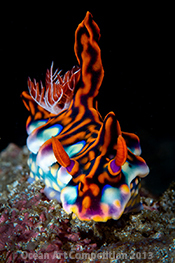 The Seafari is the brainchild of Joel Uichico, a long time diver and resident. 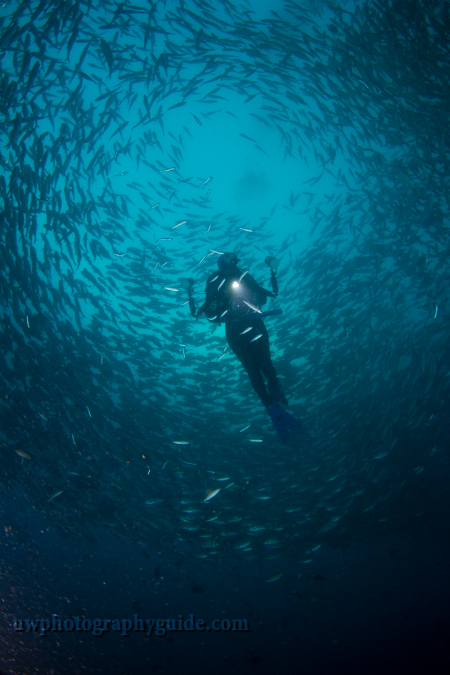 Joel’s experience as a diver, entrepreneur and resort GM all came into play as the guiding strength behind the Seafari. 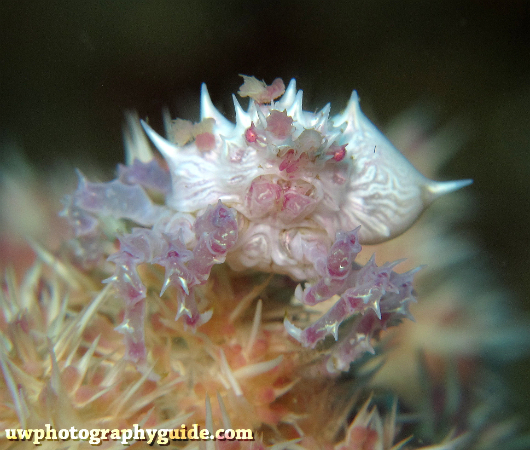 The event began to pick up momentum during a dive guide training seminar hosted by Mike and Bunnee Santos. The idea was brought forward to the Department of Tourism (DOT), and it was then that the event became official. 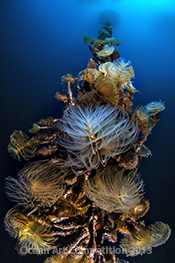 The areas selected to represent the Philippines as a global premier dive destination are as visually stunning above the surface as they are below. 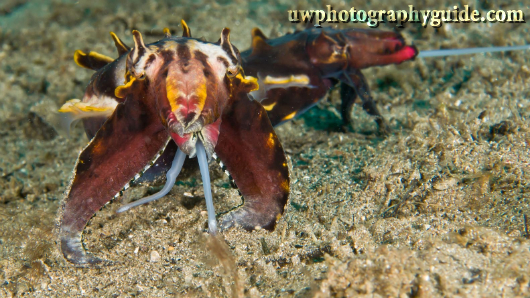 My longtime favorite Anilao represented Luzon, known for its rich biodiversity and nudibranchs. Coron, from the Vasaya and Palawan region is steeped in maritime history and includes countless recreational-depth WWII wrecks. 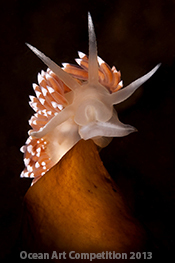 Bohol, also from the vast Vasaya region, is known for its macro life and the Chocolate Hills, and from the Mindanao area Davao, also a hotspot for critters and nudibranchs. The event is purpose-filled, serving as a platform to not only shine a light on the incredible diving and Filipino hospitality but to properly recognize the dive guides as an integral part of the whole process. I know from personal experience that my guides are like family. 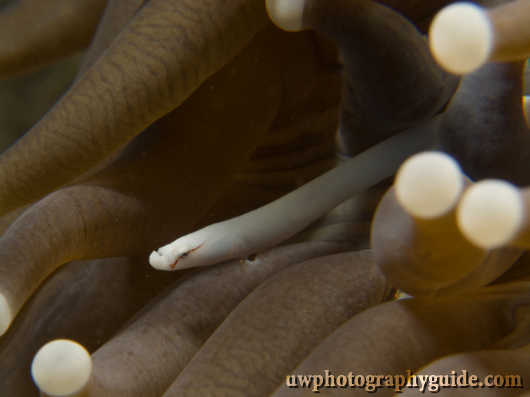 They are just as excited about finding new animals and critters as we are to photograph them. 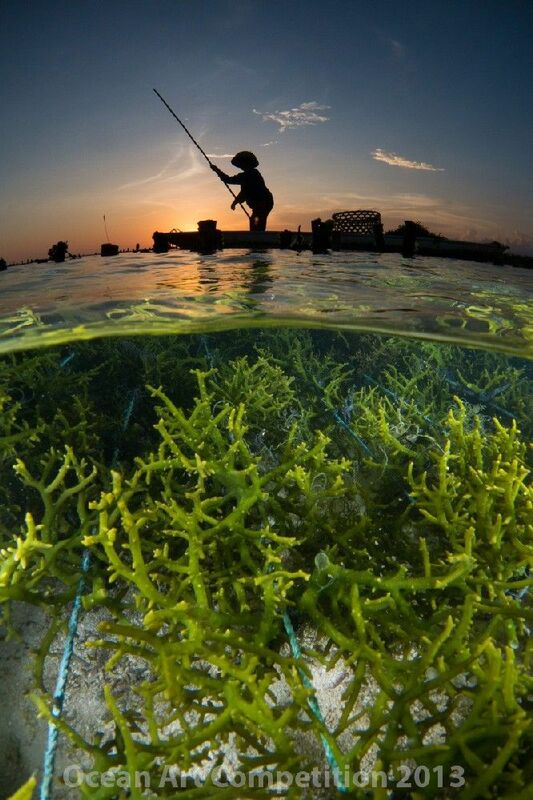 The guides are often longtime fisherman that are introduced to diving as a means to earn a steady income. In turn they begin to recognize the importance of being a shepherd to preserving the reefs and their bounty. The entire Seafari event culimanted at the beautiful Ayala Square Museum with an afternoon full of presentations of videos and still photographs shot by local and internationally acclaimed artists such as Gutsy Tuason and Marissa Floirendo. Delegate presenters included Robert Yin, Dave Allen, Bob Whorton and Lawrence Alex Wu with short videos and stills from each of the four delegated regions. The room filled with excitement as building anticipation of the winners was announced from the local competitions. Several dive guides from each of the four regions won some great gifts, and had the chance to be honored as their names were called. 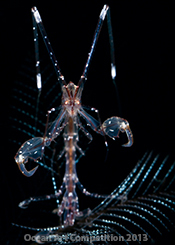 The Best in Show piece, which was a whip coral shrimp set against a nice blue background with a sunball, was unveiled as the crowd cheered and clapped loudly. The Department of Tourism, delegates, dive guides and public attendees all enjoyed a nice mixer afterword to chat and relish in the great events of the evening. Looking at the wall of the winning photos, we were all reminded of the reasons why we were all brought together in the first place. The Philippines has been graced with so much natural beauty that it is hard to describe. 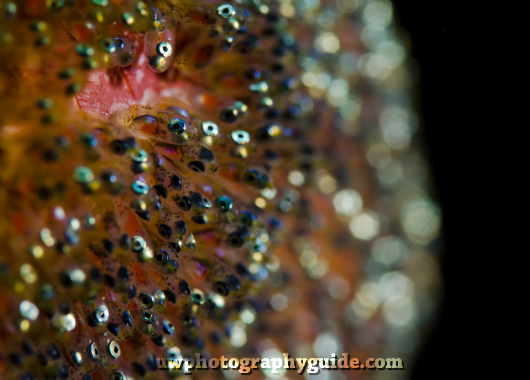 Above and below the surface, it is truly a diver's and underwater photographer’s paradise. 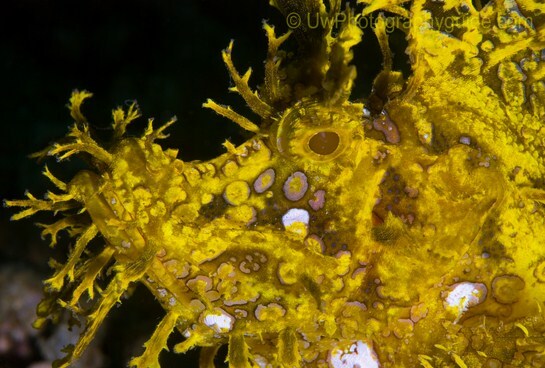 Unique as the isolated atoll of Tubattaha to the critter rich muck dives of Anilao and Dumaguete. 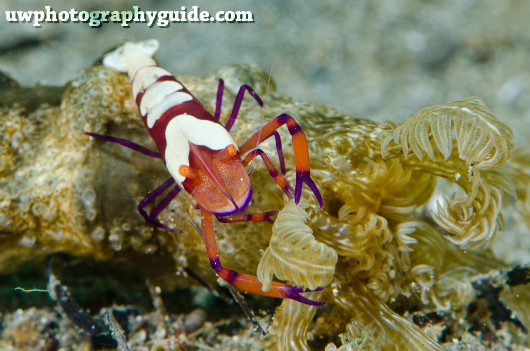 From wreck diving and the incredible colorful coral reefs, the Philippines truly have it all.